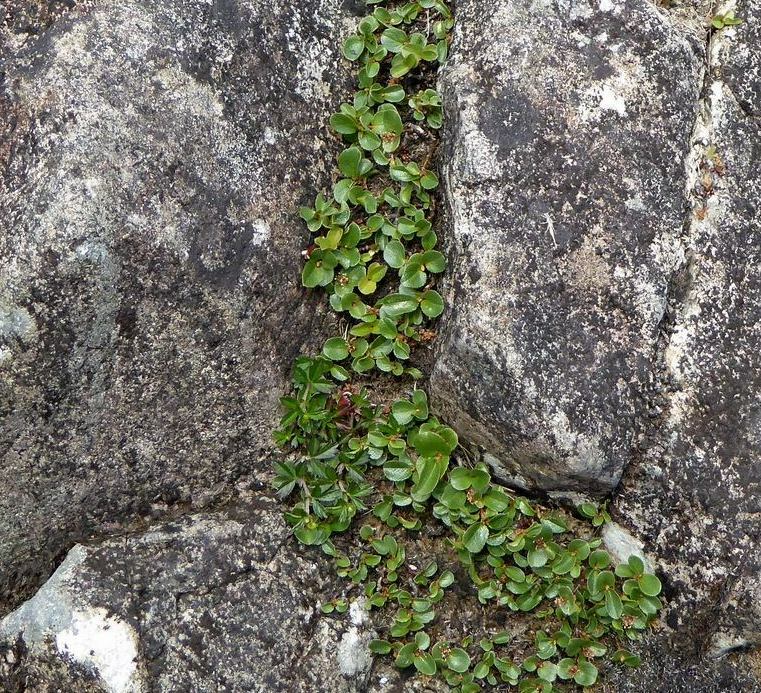 The most striking find in 2018 was probably the small colony of Dwarf Willow, Salix herbacea, on boulders by Wast Water, on the Flora of Cumbria field-meeting in Wasdale on 4th June. 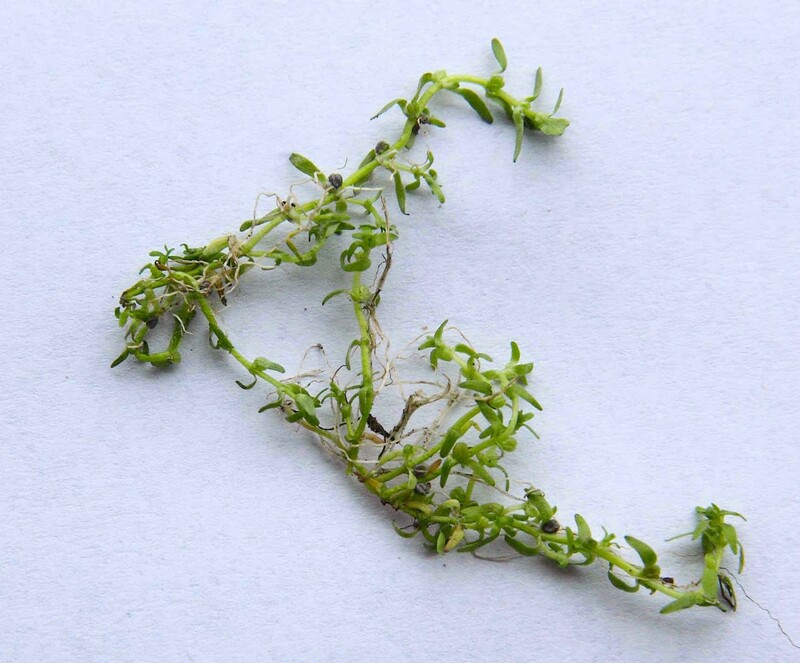 Found by Phill Brown and his team, and spotted first by Karl Bartlett, the patch is at only 64 metres O.D., and obviously of considerable, or even great, age. 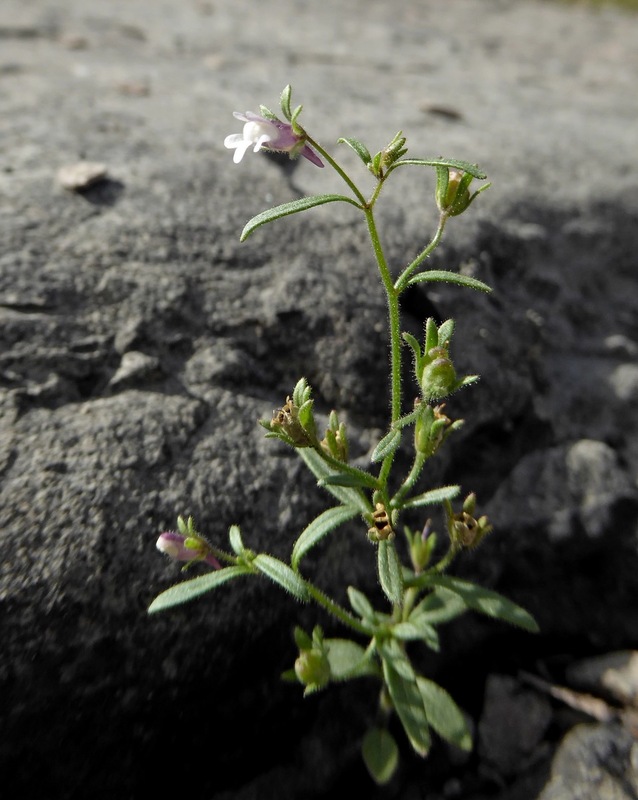 This species thrives in very exposed conditions on the ridges and rocky flanks of Lakeland, and to a lesser extant in cracks on cliffs, typically at far higher altitudes. 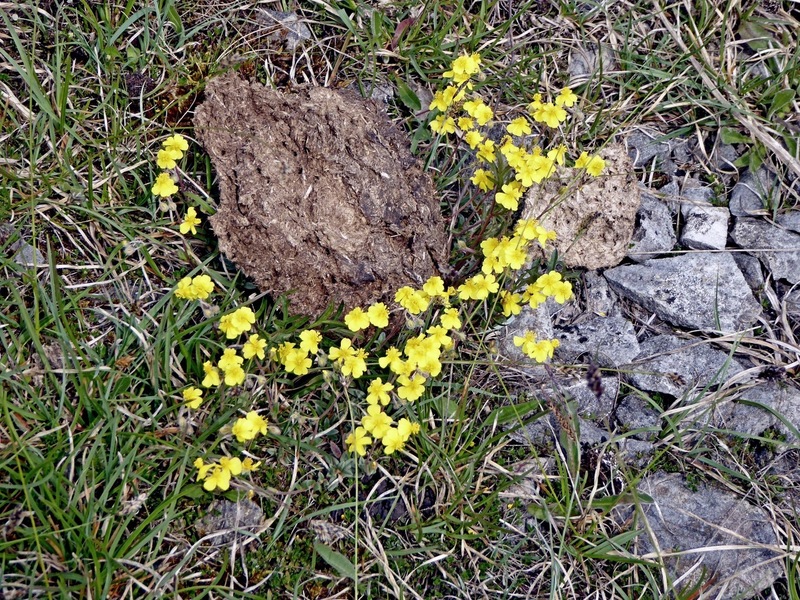 A Flora of Cumbria (1997) gives ‘640 metres’ at Cautley Crag as the lowest altitude in the county, and it occurs at similar altitudes on Ingleborough and Penyghent in the Yorkshire Dales. 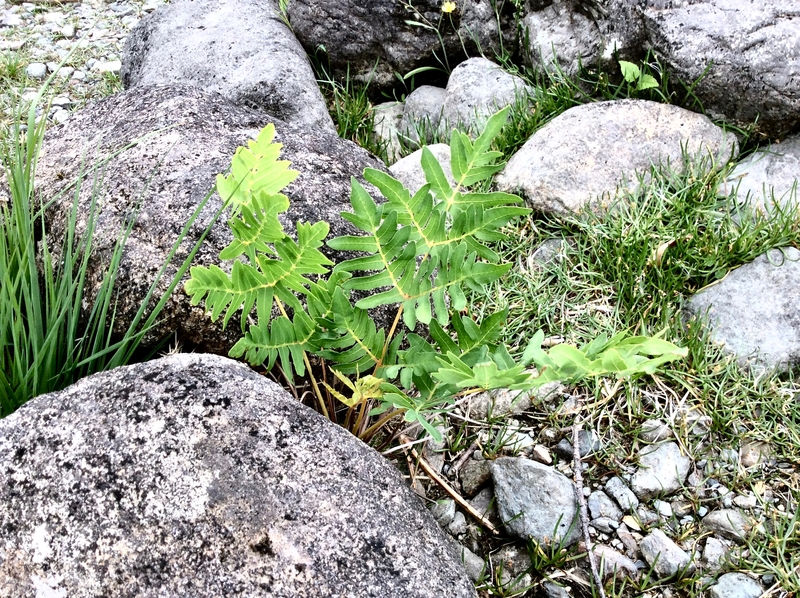 Two teams found numbers of small Royal Ferns, Osmunda regalis, on, or amongst, boulders along the shore. 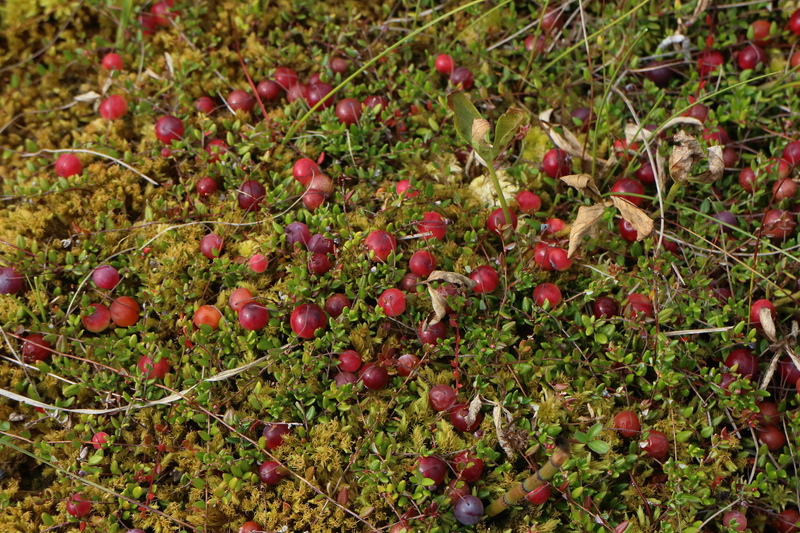 Although small, a proportion of plants seemed of some age, perhaps suffering from grazing here, causing dwarfing. 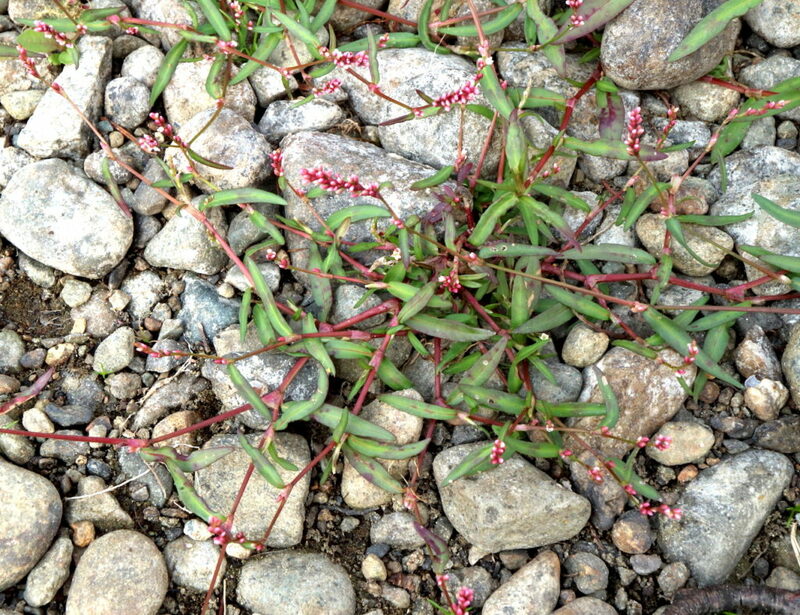 The annual Small Water-pepper, Persicaria minor, seemed to have a good season, and populations in several places on the gravel shores of Ullswater were much larger than is usual. 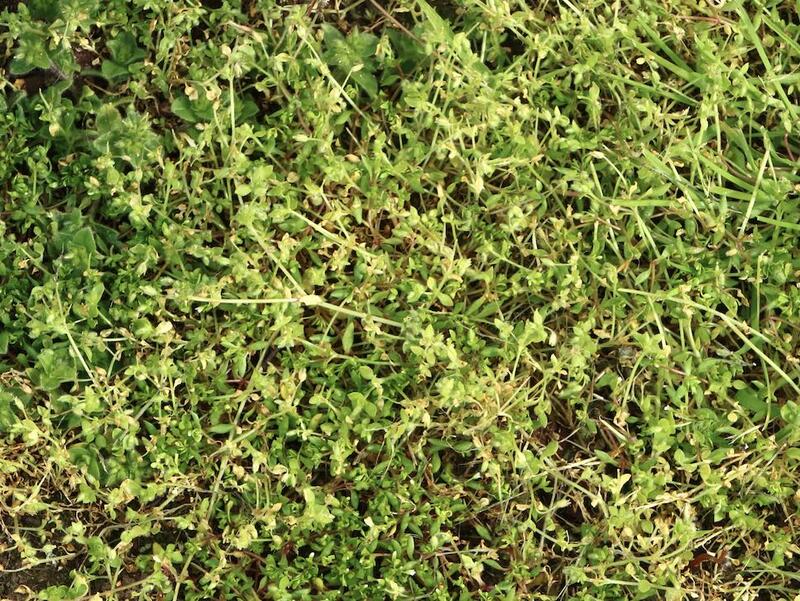 Somewhat untidy, distinctly fleeting in appearance, but apparently spreading north, is the Lesser Chickweed, Stellaria pallida, found by Phill as he recorded plants around the Southwaite Services of the M6. 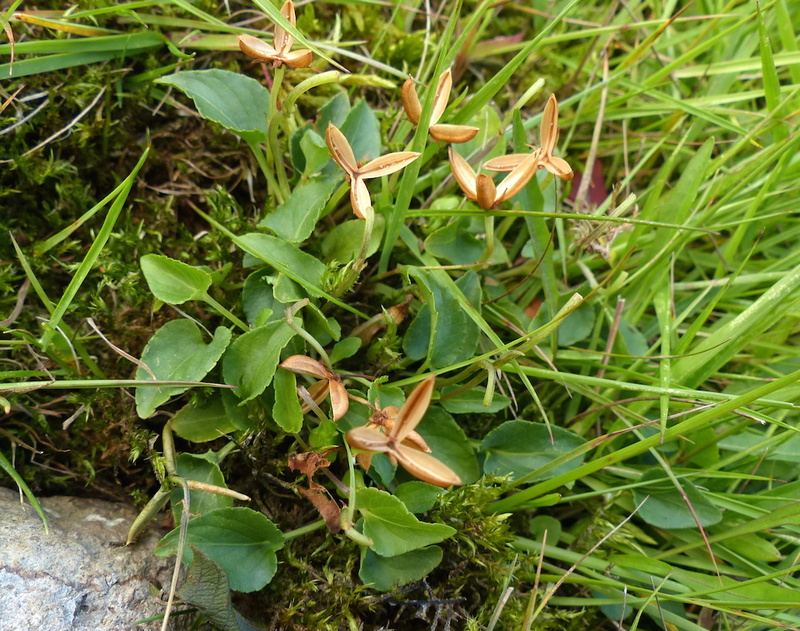 Lesser Twayblade, Neottia cordata, had a good season on Armboth Fell. 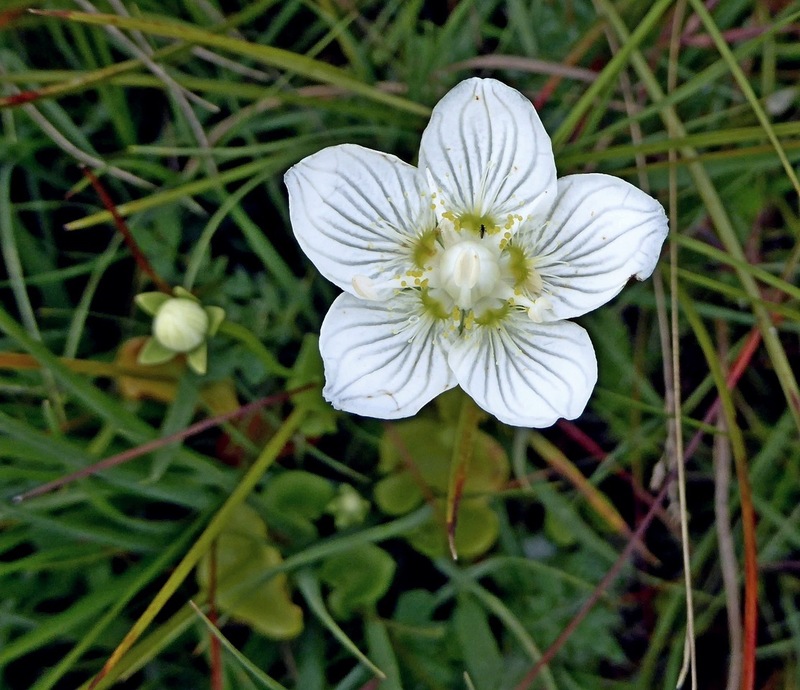 Caz Walker came upon a huge patch of Alpine Saw-wort, Saussurea alpina, on Blea Water Crags, emerging in May; it was in full flower – probably the best patch in Lakeland – in July. 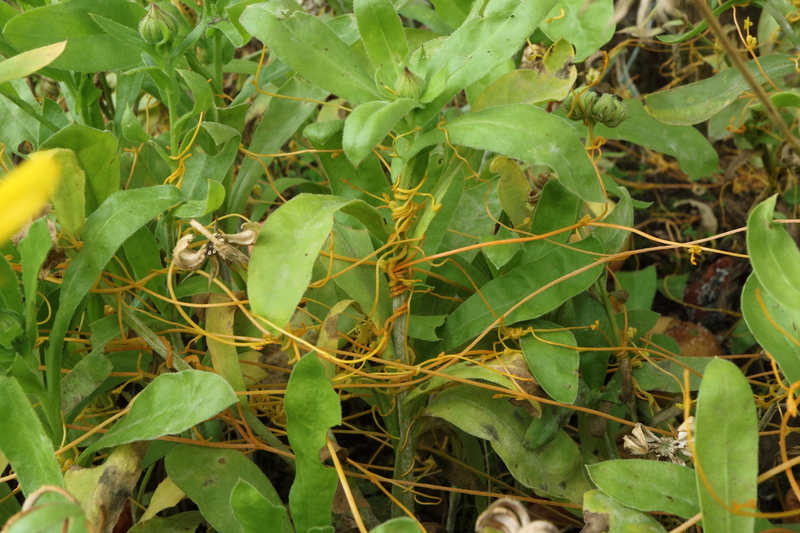 Two patches of Yellow Dodder, Cuscuta campestris, developed with great speed in a garden at Wetheral Pasture in September, throttling patches of Calendula. It is a first record for the county. 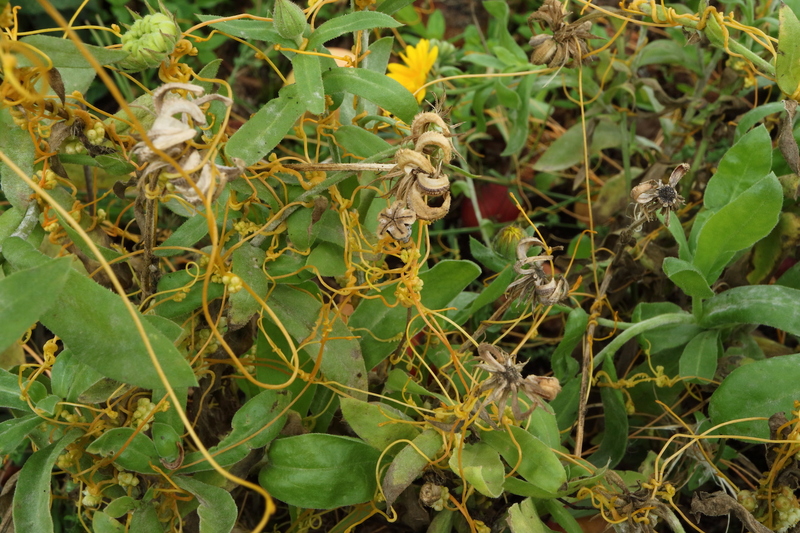 It probably arrived with the Goldfinch-favoured bird-seed ‘Niger’, Guizotia abyssinica. Some items of interest, in no particular order. 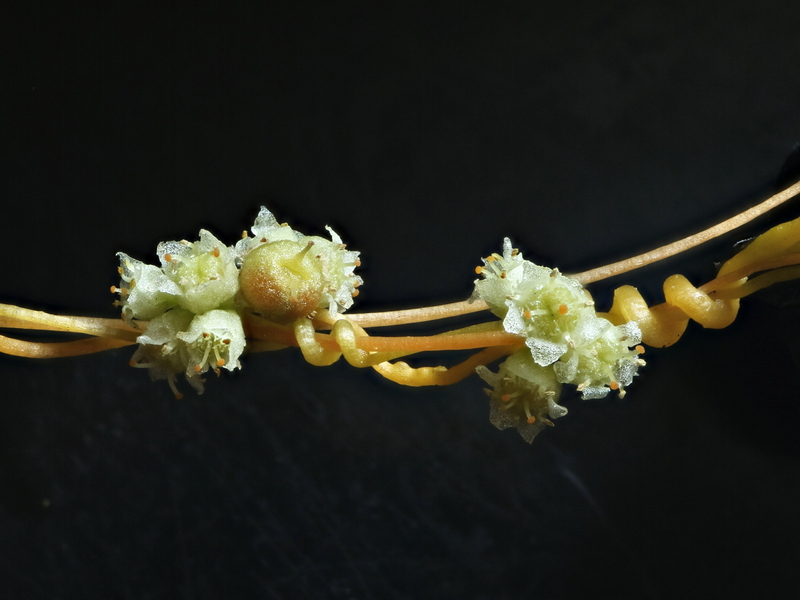 Keeled Garlic may be increasing in the county. 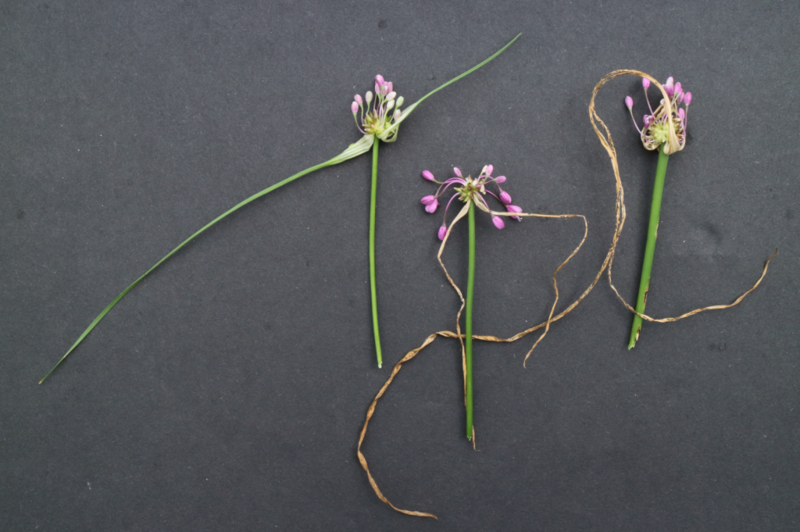 The pair of very long spathes is distinctive, and there are floral differences also from its closest look-alike, Field Garlic, Allium oleraceum. 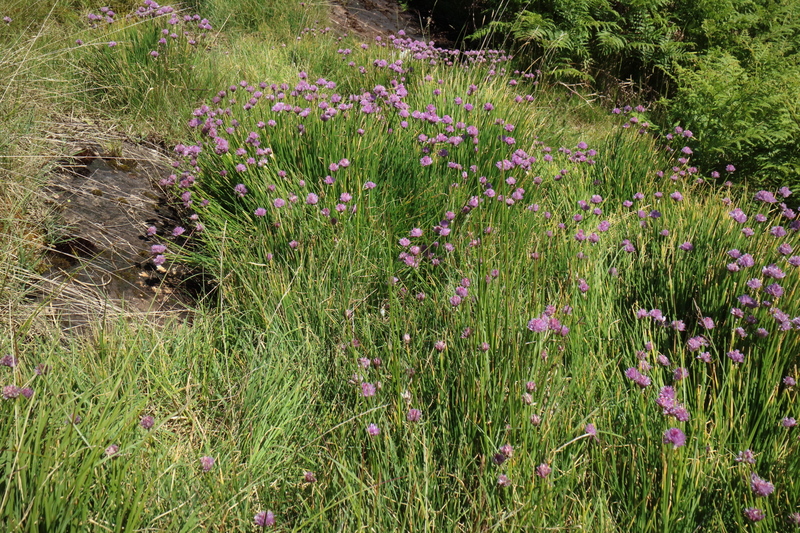 Lee Schofield (RSPB) showed us some remarkable spreading and vigorous patches of Chives in two damp seepages above the road – a curious sight in this upland and +/- acidic site. 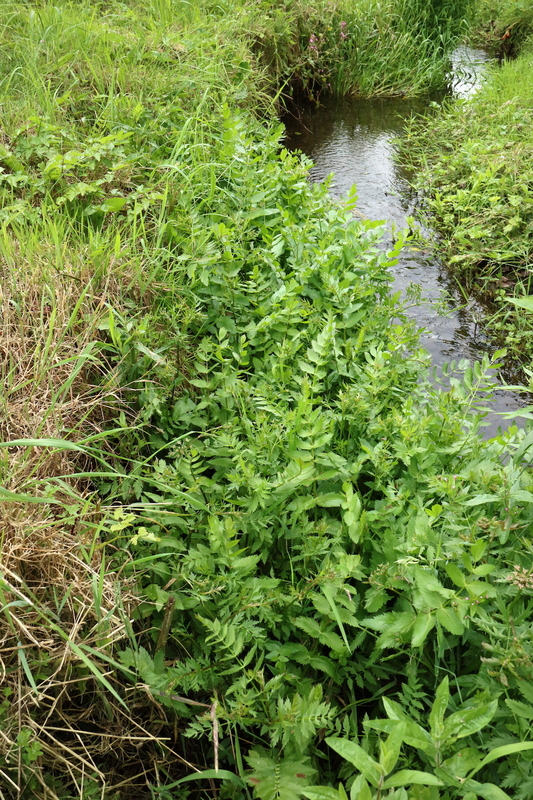 Berula lining a stream at Hutton-in-the-Forest. Found by Dave Hickson and John Parker at Catterlen. 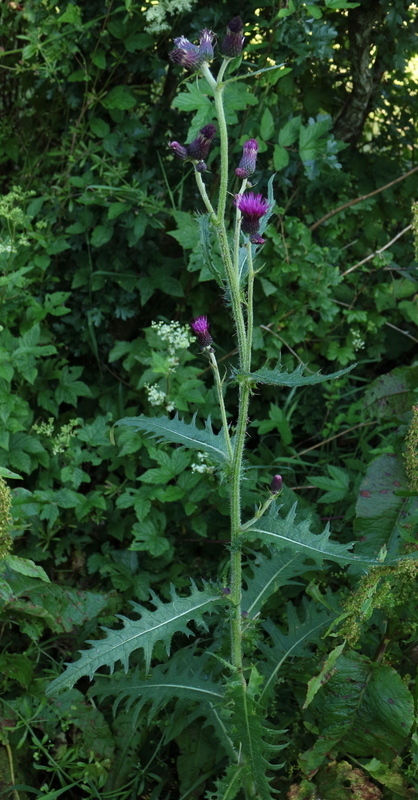 There was just a single shoot here of this Central European thistle. 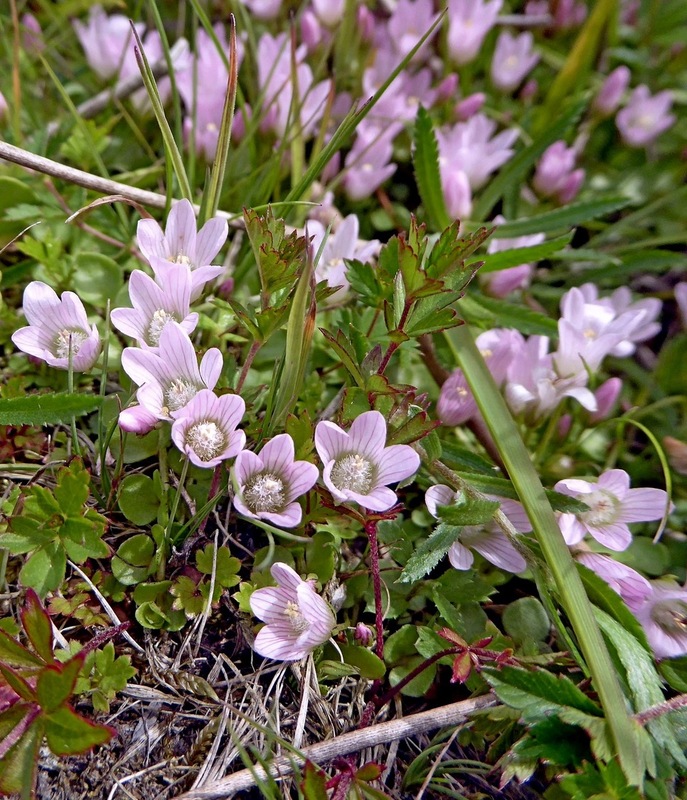 Rod Corner found a “flourishing colony” in 1988 nearby, but this may be its ‘last stand’. Several plants (and perhaps some hybrids) around the glasshouses and propagation beds at Hutton-in-the-Forest. 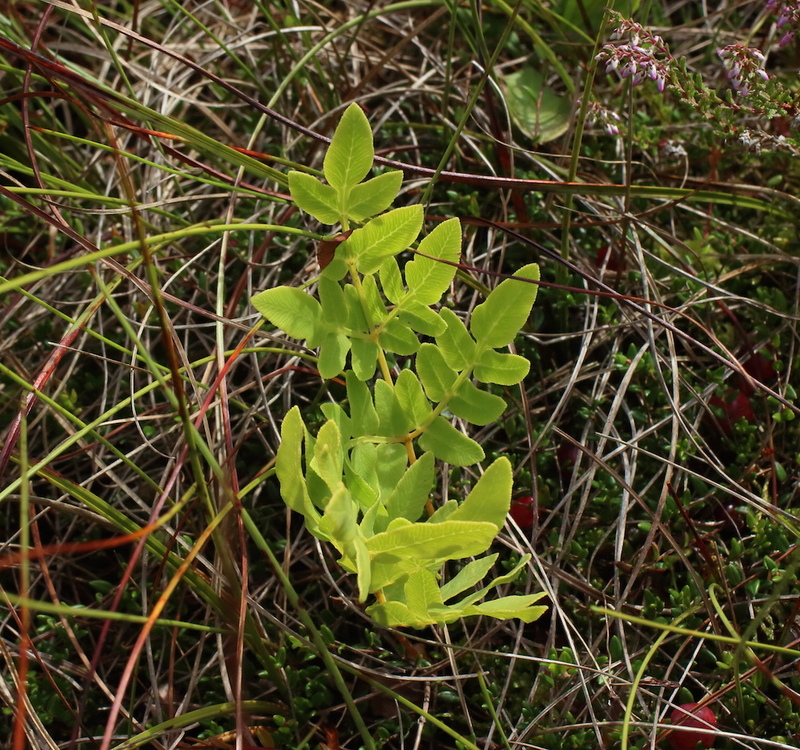 A rare plant in north Cumbria. 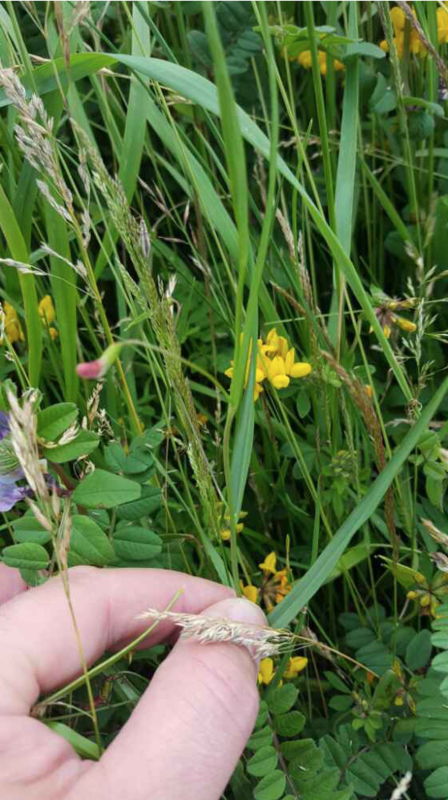 A good find by Graham Bell at Whitehaven of this rare ‘grass-leaved’ vetch. 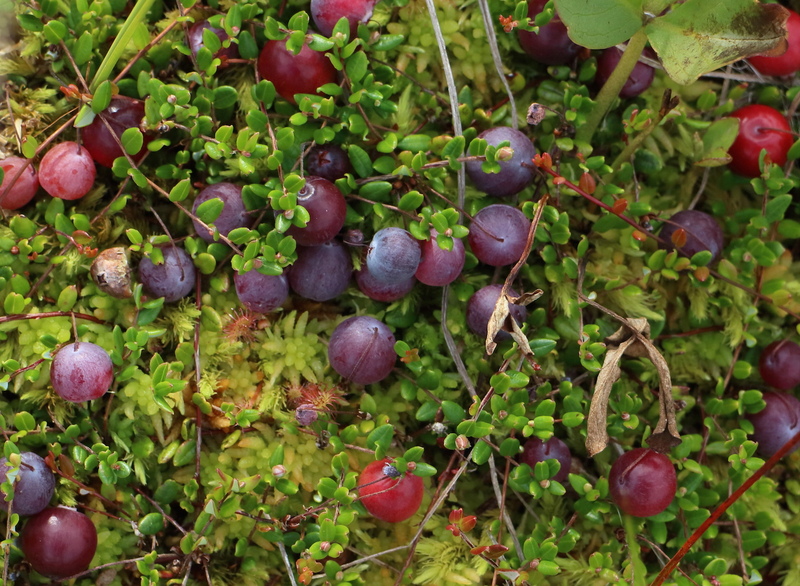 Abundant along the edge of a pond at Edderside, found by Debs Muscat. 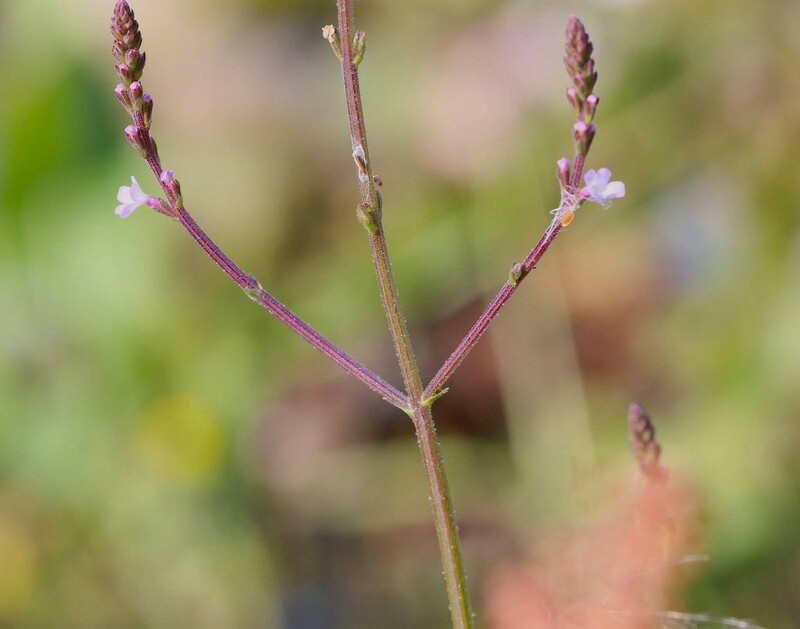 A well-named plant! 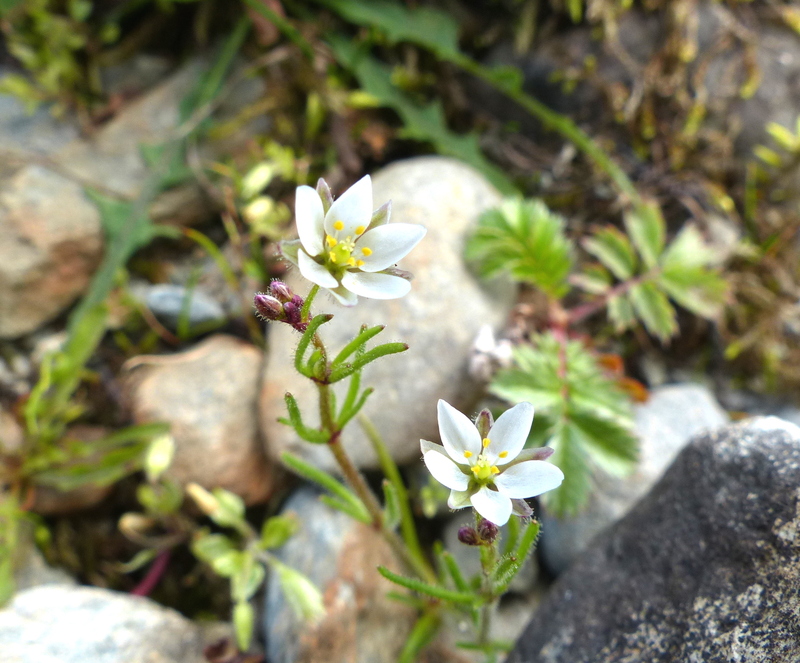 The tiny white star-like flowers are just visible (at least if you enlarge the photo!). 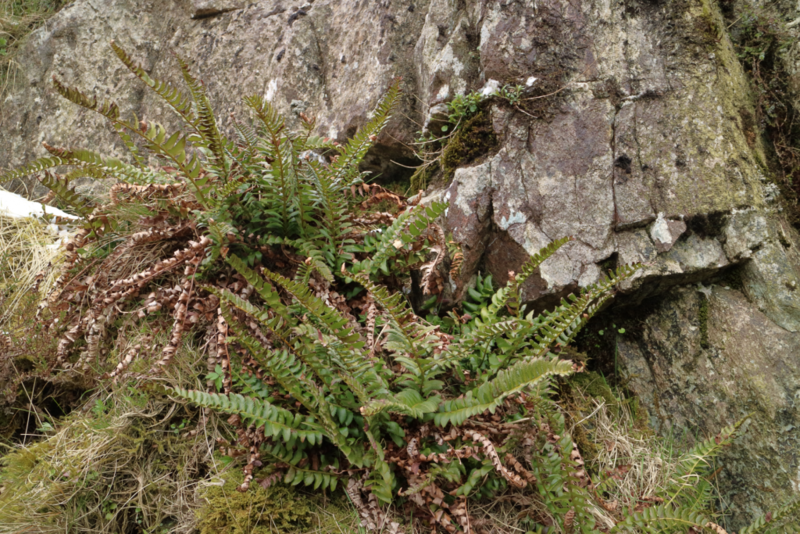 Some fine, old plants of Holly Fern on the sheer cliffs of Mardale, shown to us by Lee Schofield of RSPB. 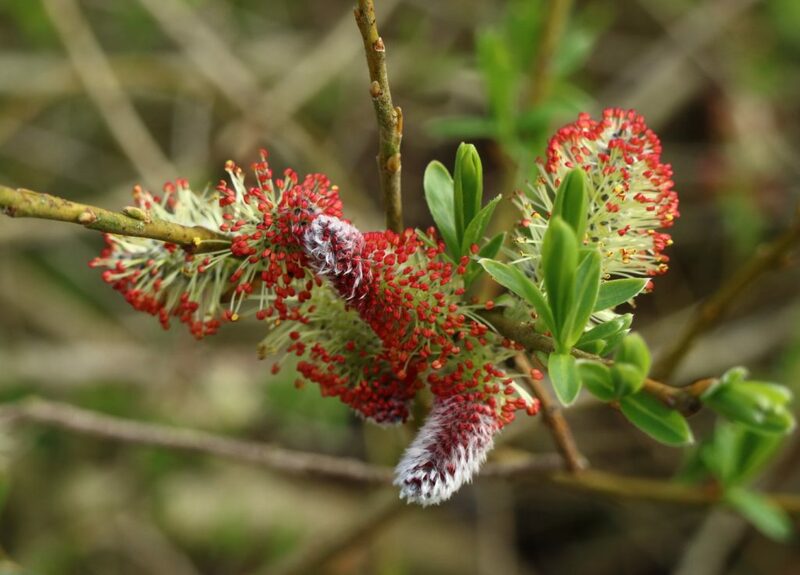 The striking male catkins of Purple Willow along the River Caldew. Good to see that this is still persisting under Eden Bridge, despite the scouring floods of recent years. It was found here originally by Rod Corner. The only extant site in the north of the county? Here’s some recent items, from a very busy summer! 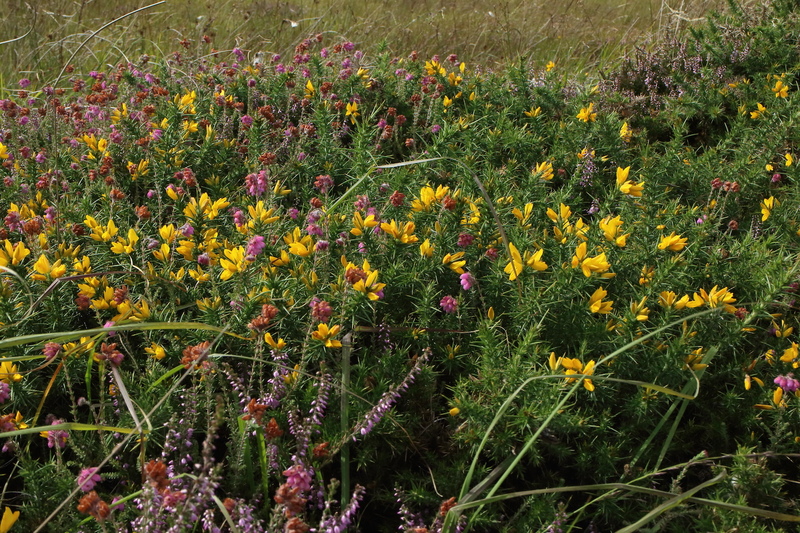 A recording day in SW coastal Cumbria, with Cumbria Biodiversity Data Centre, organised by Gary Hedges. 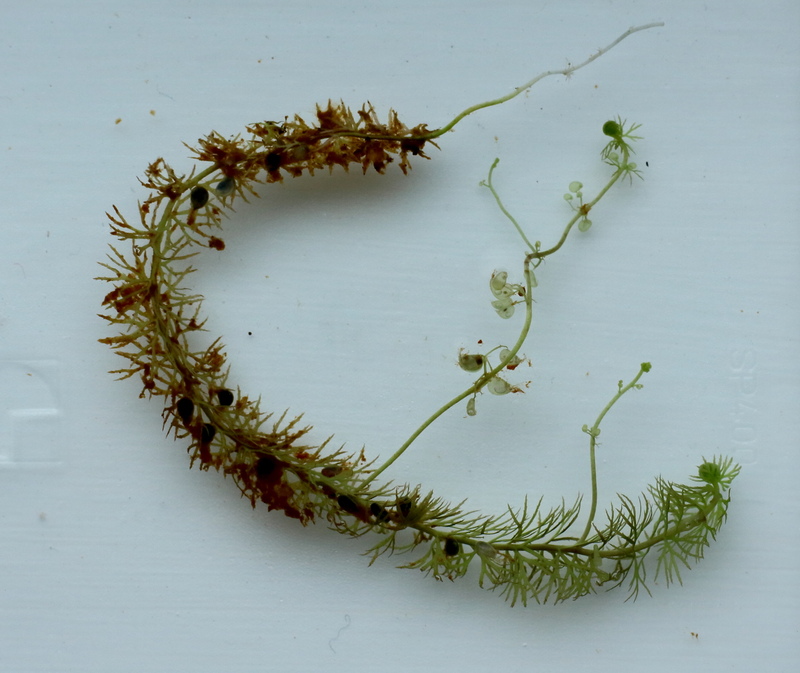 We looked at Low Church Moss, Beckermet, NY045057, and at the cluster of kettle-hole mires between Braystones and Nethertown, of which Silver Tarn (NX998068) is the largest. 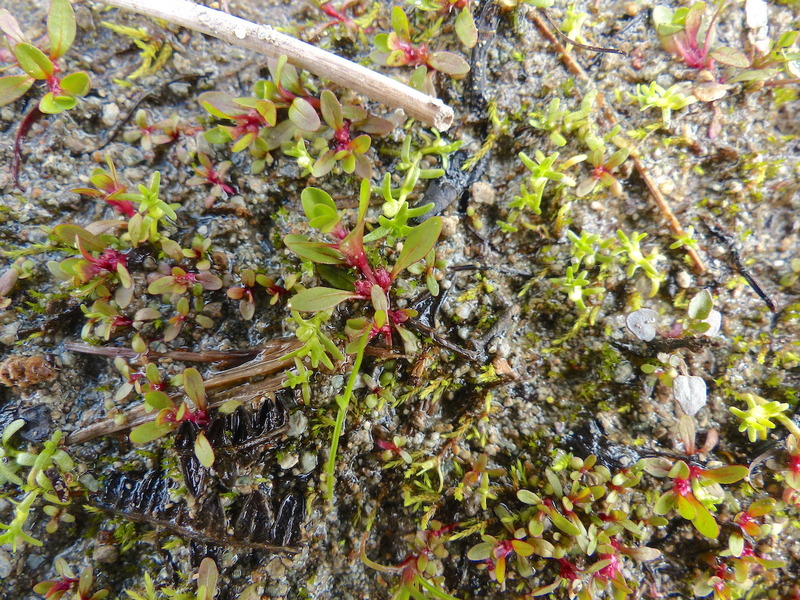 A Flora of Cumbria Recording Group meeting in the Blea Tarn area (the Blea Tarn between Great and Little Langdale): a small amount of a bladderwort in one of the ditches at the outflow fitted Utricularia stygia, seemingly the most common (or least rare) of the intermedia aggregate in the county. The amazing “quadrifid hairs” on the inside surface of the (2mm long) traps have to be exposed and must be examined to get a firm ID. 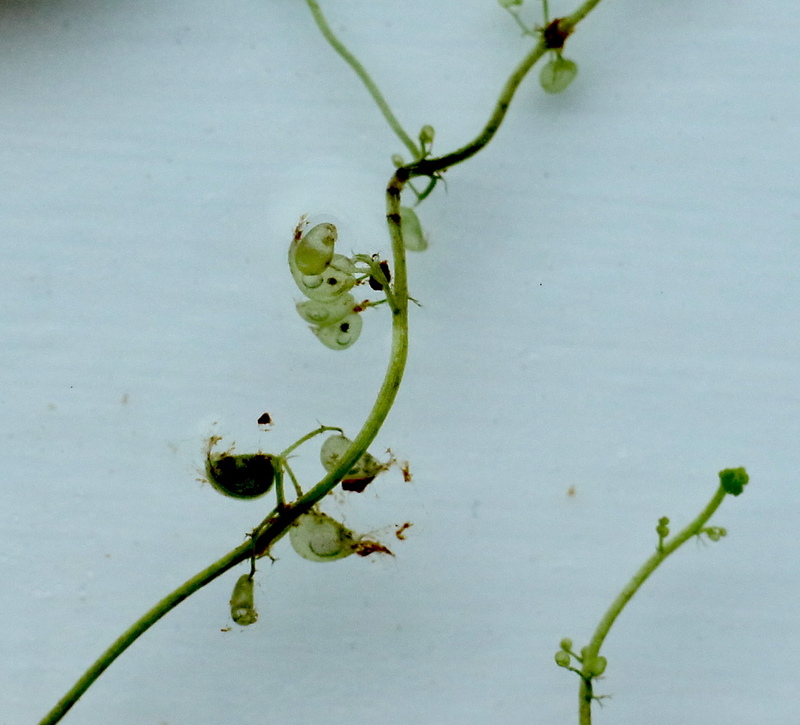 I find it best to get a photo and work from that to estimate the divergence, etc., of the hairs’ arms. A walk along the boardwalk over Bowness Common (starting from the RSPB carpark at North Plain Farm. 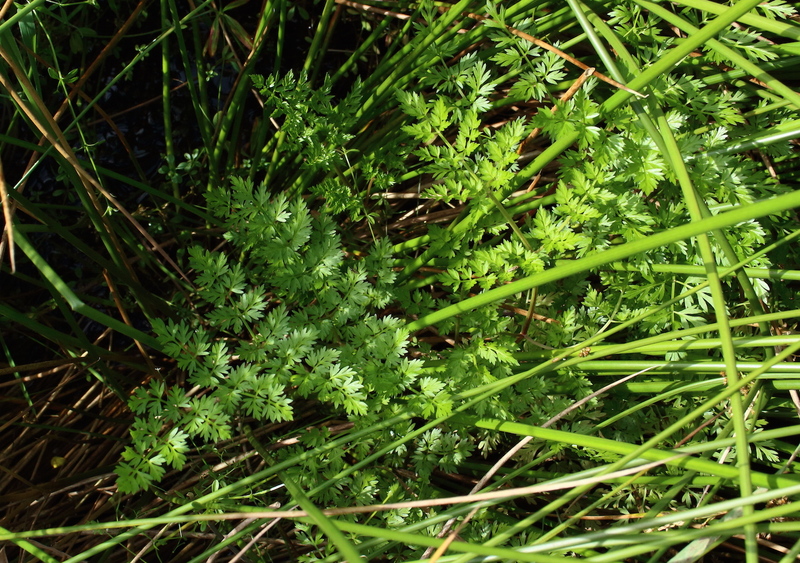 Most surprised to see a good colony of about twelve large plants of Fine-leaved Water-dropwort, Oenanthe aquatica, by one of the ponds just before the hill up to Rogersceugh Farm. This is only the second extant county record, the other being in a ditch along the Roman Wall west of Irthington in the north of the county. 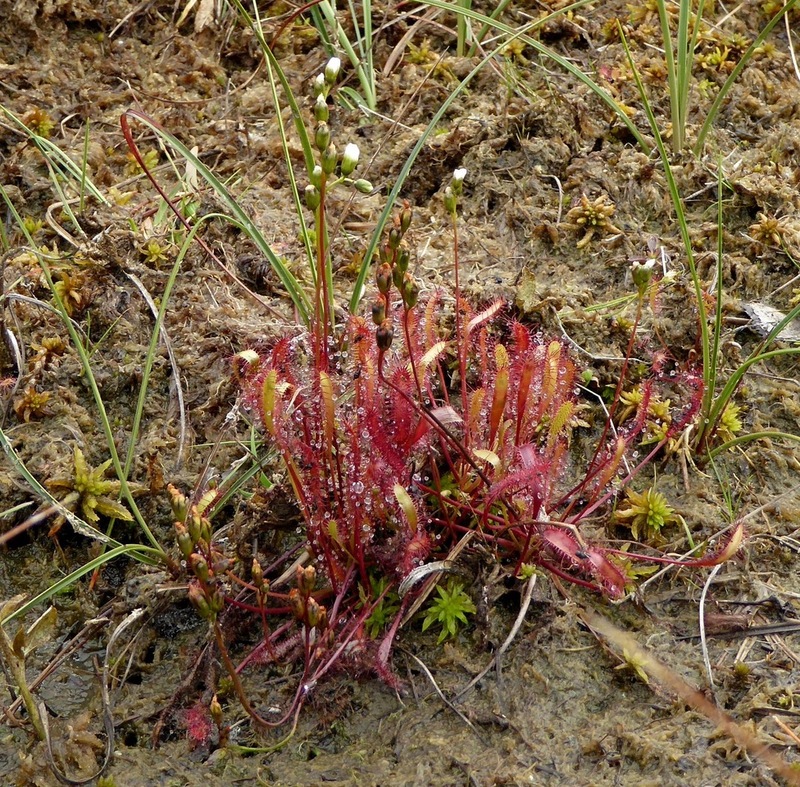 A surprisingly rare plant in the county. 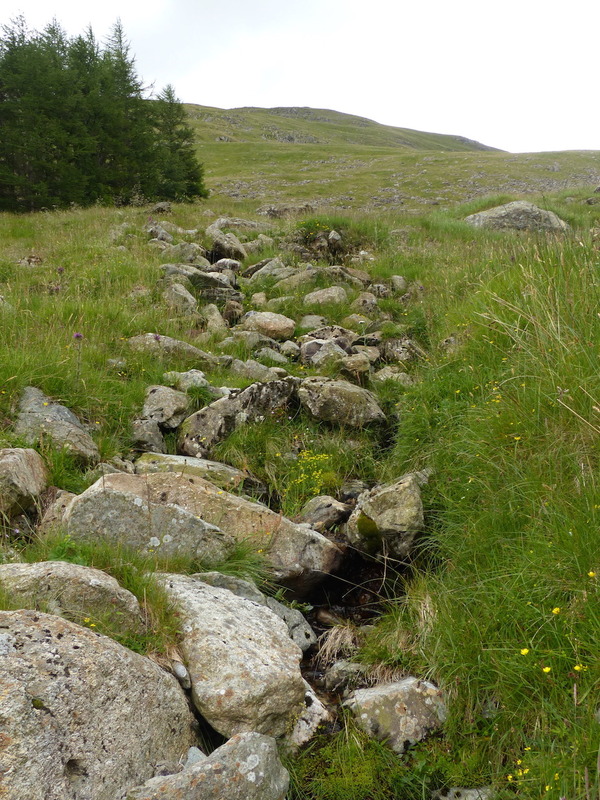 Phill and I met with RSPB manager at Haweswater Reserve, Lee Schofield, and we looked at a section of the Reserve along Gatescarth Beck which now has an exclosure fence, and already is illustrating how rapidly such herb-rich areas of the Lakeland uplands (260-330 metres a.s.l.) 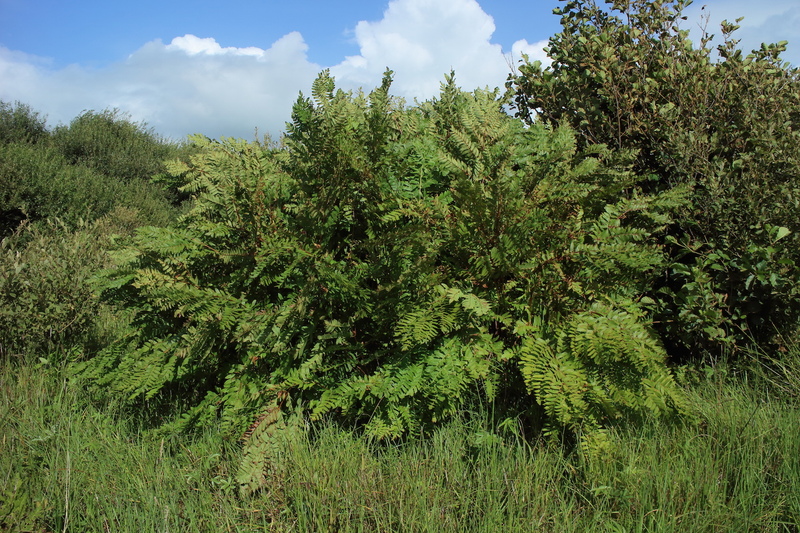 can ‘recover’ when the vegetation is allowed to ‘go its own way’ for a spell. 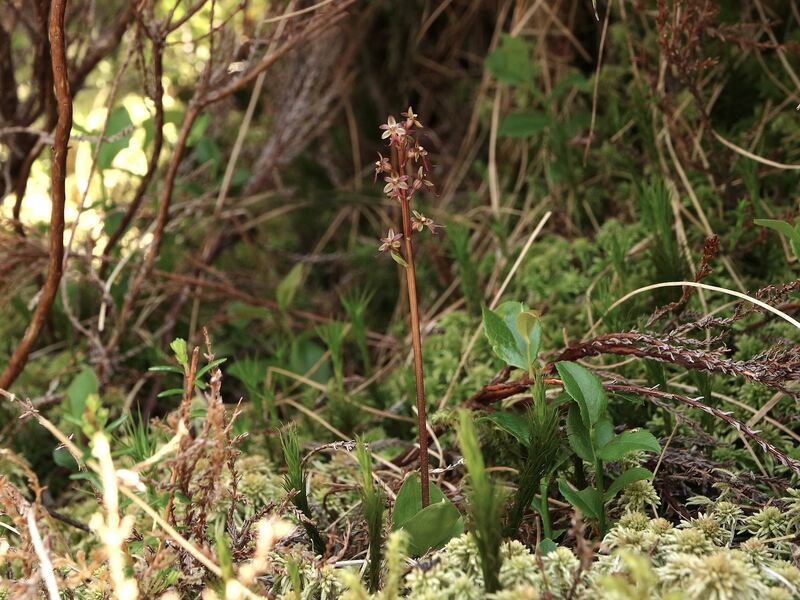 The RSPB, in partnership with United Utilities, plan to develop an area at Mardale Head to show off the diversity of Lake District flora. 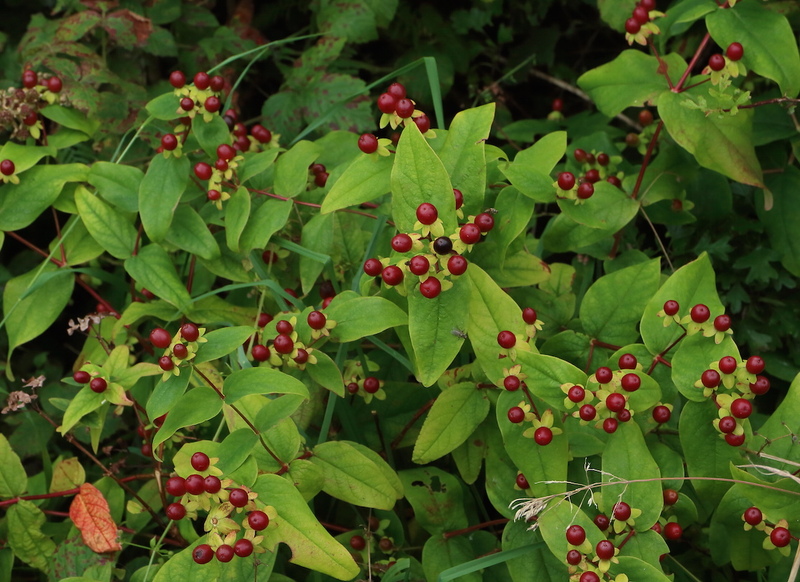 They have identified an area, already reasonably botanically rich, that will be fenced to exclude livestock and deer to encourage greater diversity. 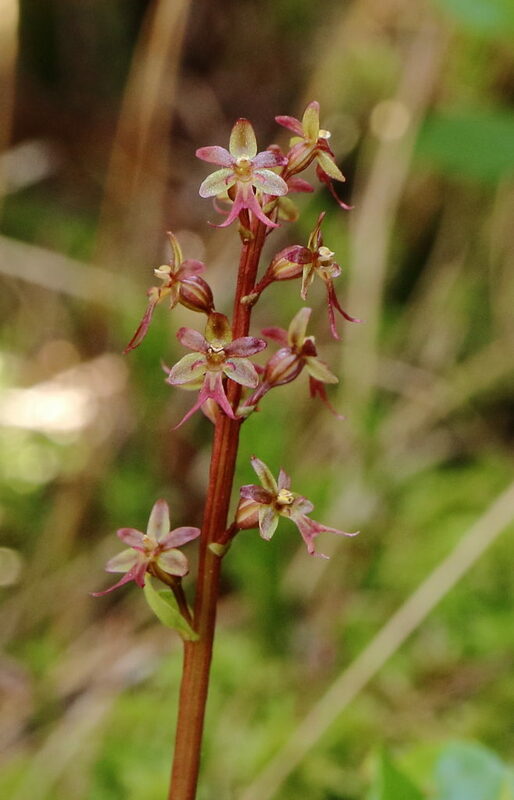 Nearby Harter Fell is well known as a crag with a good mountain flora, but the many wonderful and colourful species that grow here are out of sight from the general public. 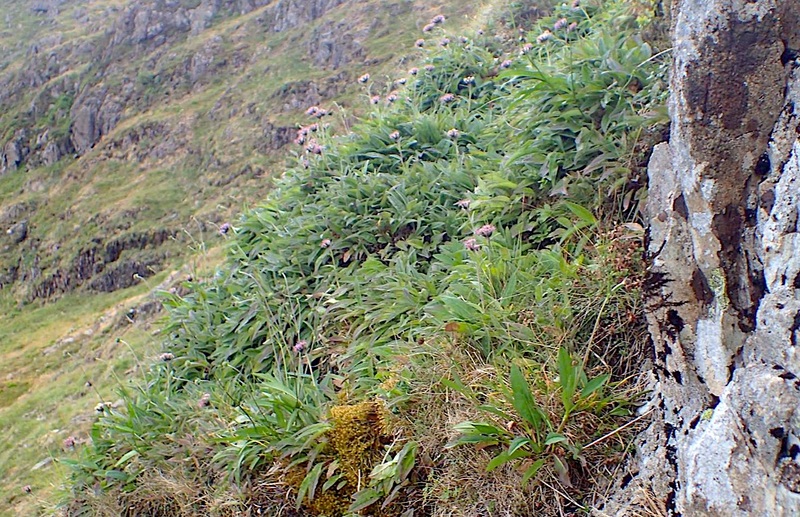 Many plants that we consider ‘mountain plants’ only grow on crags and ledges since these are the only places that they can escape grazing pressure. 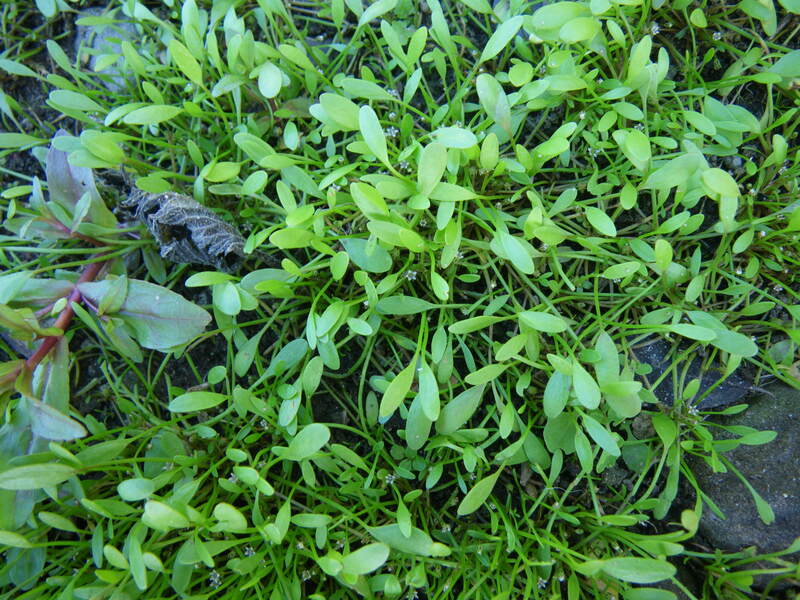 Given the opportunity, these species will happily grow in more easily accessible areas. 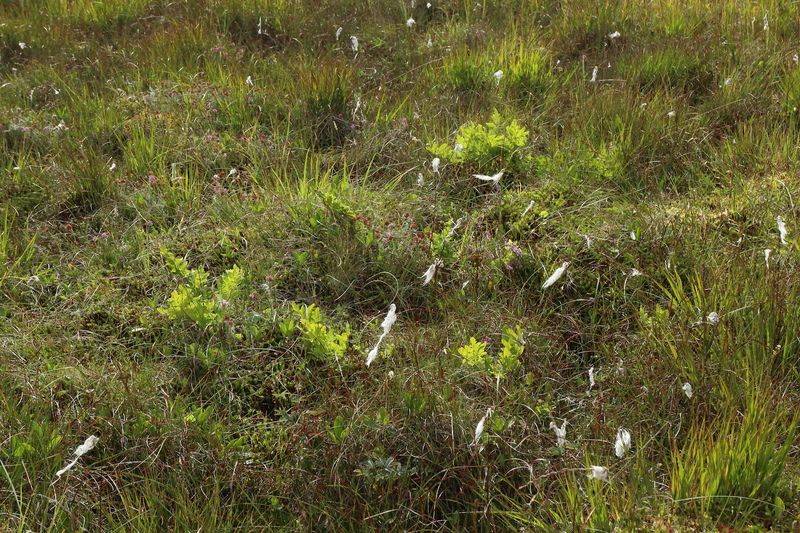 There are various places around the UK where livestock exclosures have been put up and a diverse upland sward can now be seen, Ben Lawers in Scotland being one of the most well known. 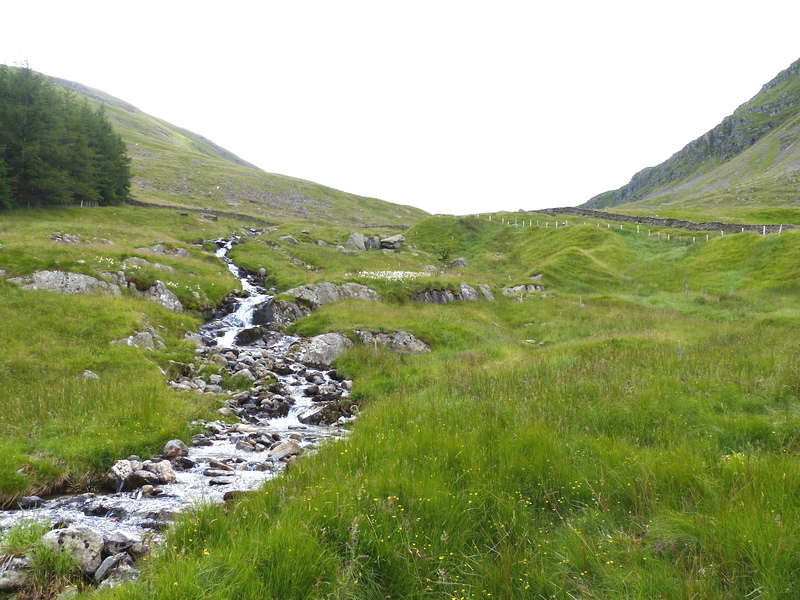 There are no equivalents in the Lake District, so it is hoped that over time, this area at Haweswater will develop into a place where visitors can come to appreciate the diverse and beautiful suite of species that were once so much more widespread. 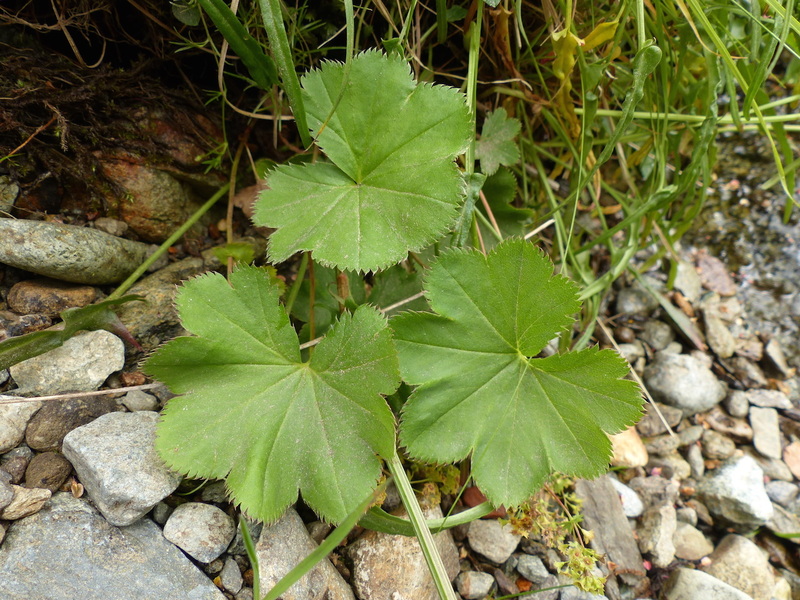 Besides three saxifrage species (Mossy; Starry; Yellow) and many other herbs, most striking was the presence of about thirty plants of Alchemilla wichurae, Rock Lady’s-mantle, down the stream-banks. This is the only place so far in Lakeland where I have ever seen this species ‘come down off the cliffs’. 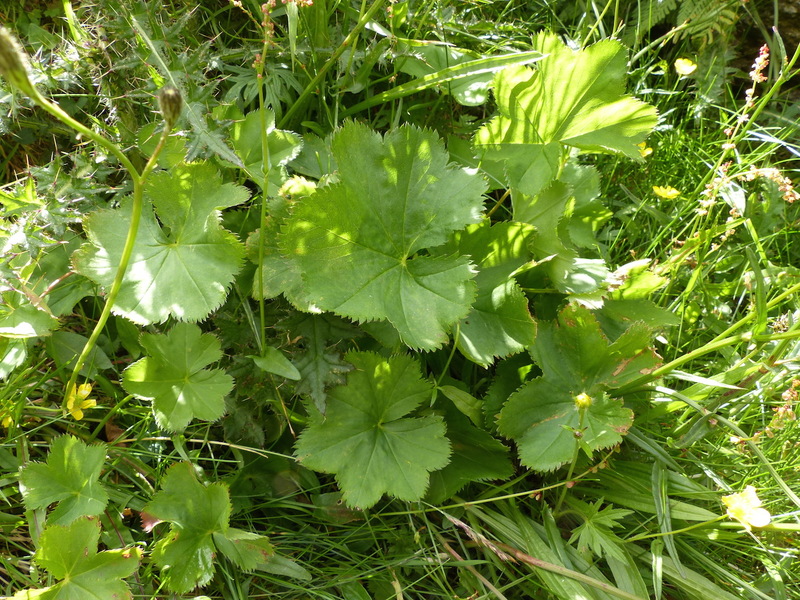 Of course, it was already here in the pre-exclosure flora, but overlooked until now amongst the small, grazed, Alchemilla glabra plants, when it has had a chance to shine! At the end of the day we dropped down to look at the large areas of silt in the draw-down zone at the head of the reservoir. 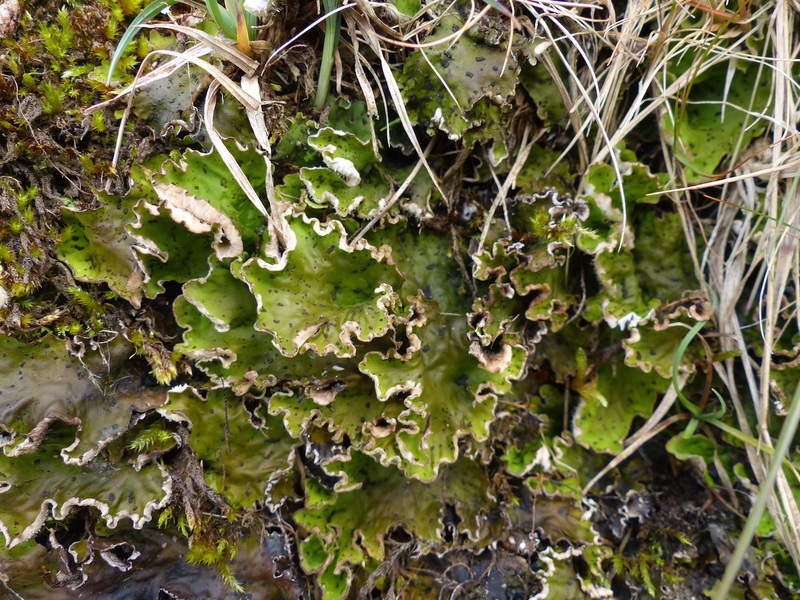 All plants were very tiny, perhaps partly through exposure to the elements (altitude 245 metres a.s.l.) here and partly the frequent grazing of Canada, Barnacle, and Grey-lag Geese! 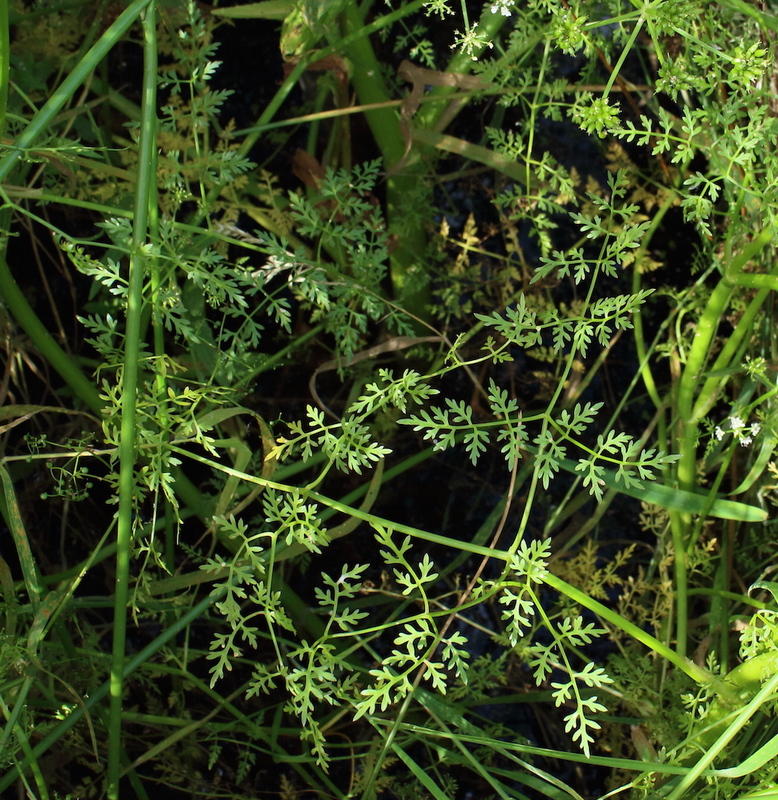 The main colonists were in sheets: flowering Water Purslane, Lythrum portula, and two water-starworts, Callitriche. 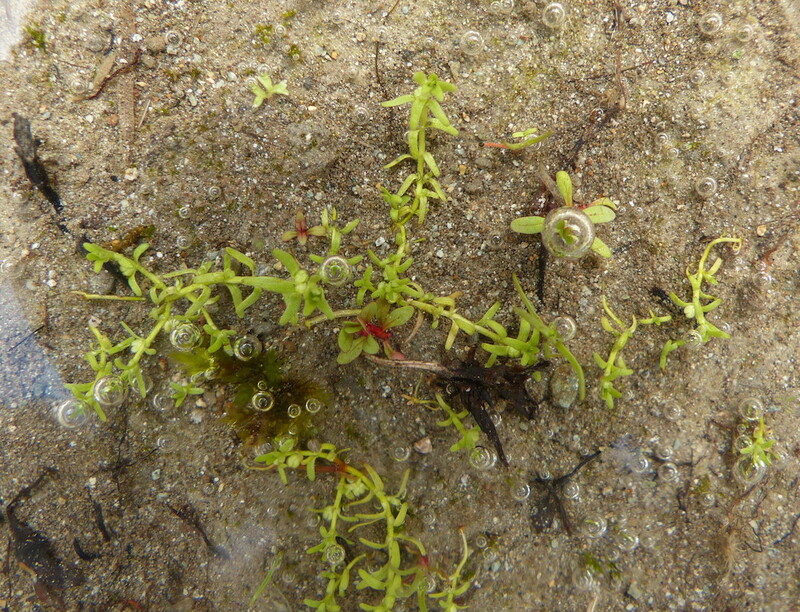 Some of the latter was the usual Common Water-starwort, C. stagnalis, with spoon-shaped leaves, but the other one, narrower-leaved, much commoner, and indeed in tens of thousands, was puzzling, until Phill washed the silt off some plants and found that the ripe fruits, previously buried, were black – an unusual character in Callitriche, but characteristic of Narrow-fruited Water-starwort, Callitriche palustris, a species new to Cumbria. 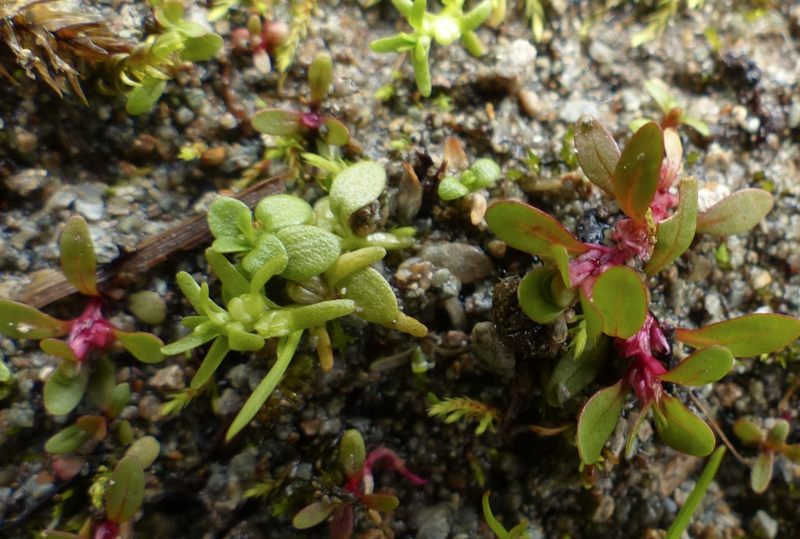 Other plants: some gravel beds had lots of tiny plants of Corn Spurrey, Spergula arvensis – a rapidly declining plant in UK as an arable weed. However, A Flora of Cumbria does mention its occurrence on the draw-down zones of reservoirs. This appears to have very few recent records for the county, and it is good news that it is still around. 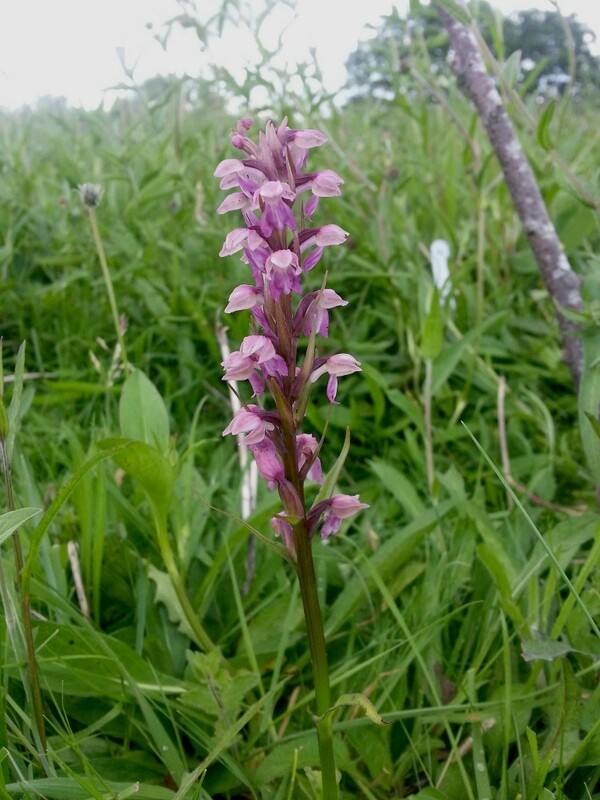 Lois Harbron writes: “I was at Augill Pasture Cumbria Wildlife Trust reserve on 21 July, counting the second flush of Frog Orchids, Dactylorhiza [Coeloglossum] viridis, and spotted an obvious hybrid of some sort from a little distance. 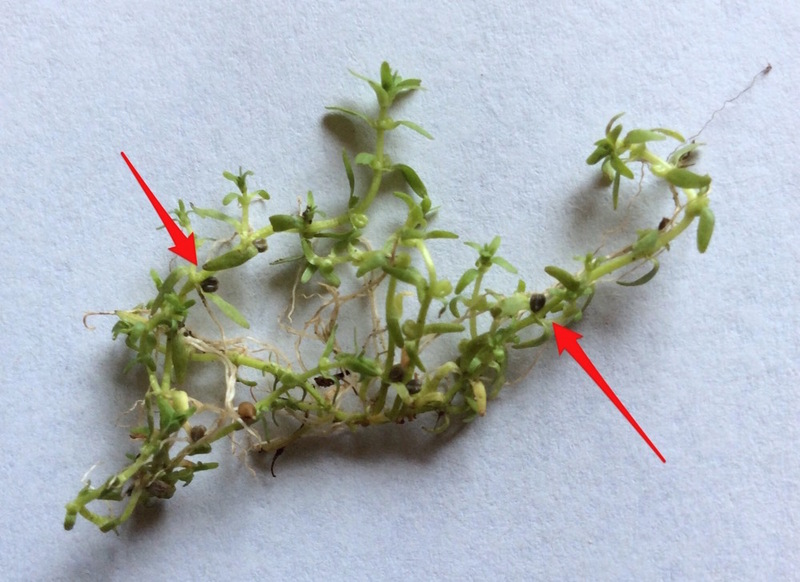 On closer observation, I was sure it was a Frog/Common Spotted hybrid [× Dactyloglossum mixtum*], given its appearance and neighbours. Luckily I was due to meet Alan Gendle nearby. He was happy to confirm my sighting, and sent photos to Richard Bateman. 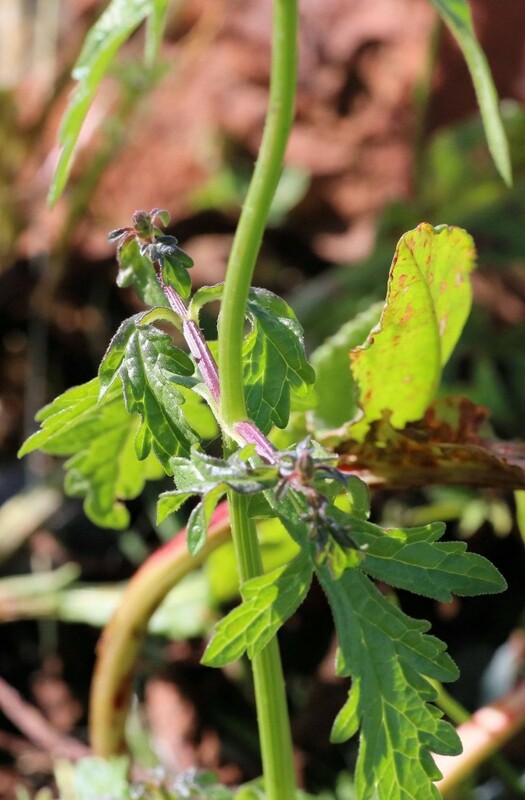 I was lucky not only to find it, but in that the plant was at its peak, a lovely specimen.” I am delighted to add her fine picture here. 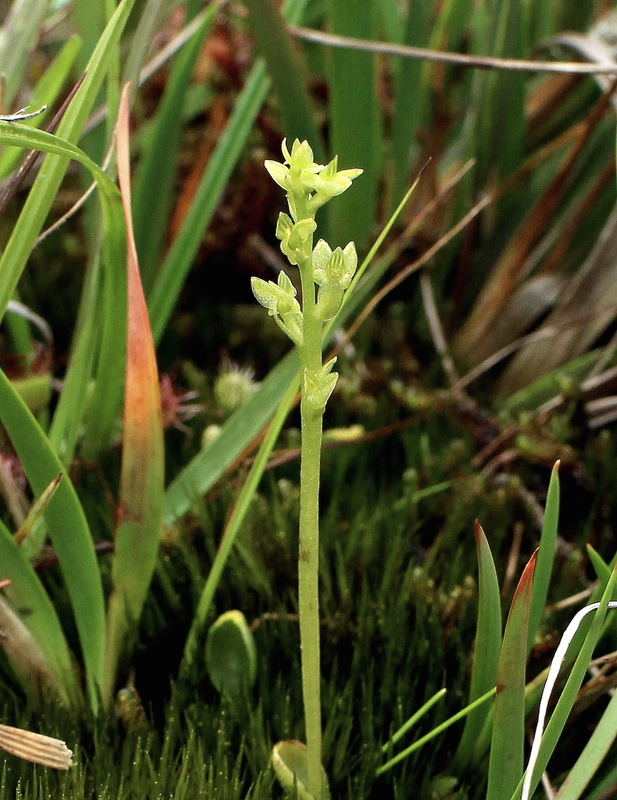 The form of the flowers is reminiscent of Frog Orchid, except the lip is three-lobed (two-lobed in Frog) and the spur is longer. 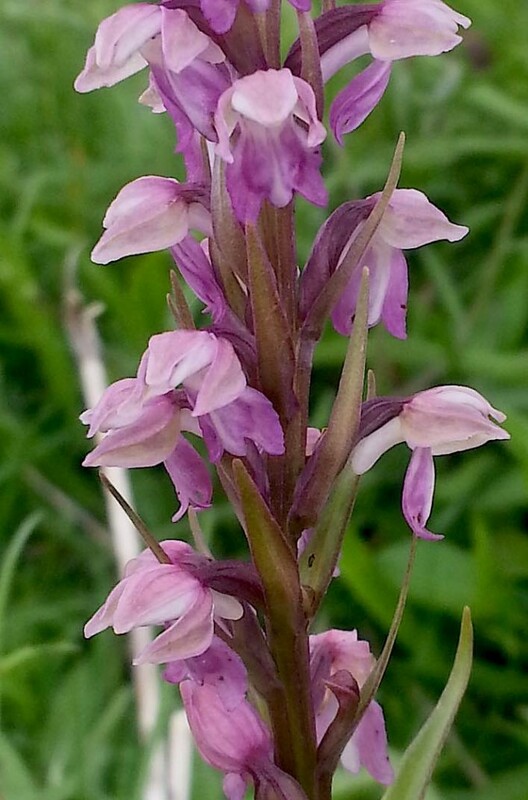 The colour of course matches that of the Spotted-orchid parent, with loop-markings on the lip somewhat ‘faded’ in this example. Is this hybrid new to the Cumbrian vice-counties? 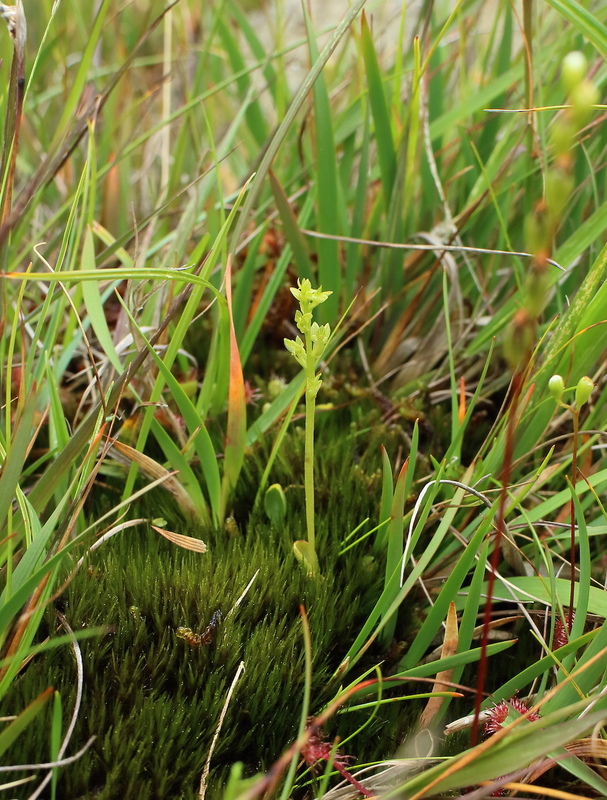 There’s no mention in A Flora of Cumbria, and the BSBI Distribution Database currently has no record. 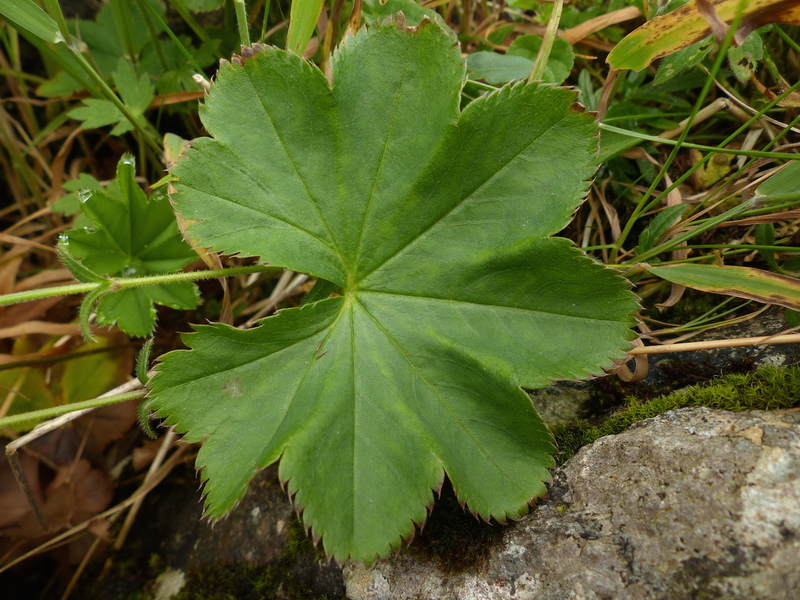 The only other record for the whole of northern England that I’ve spotted is in the new Hybrid Flora which seems to be that mentioned in the Distribution Database from Co. Durham by Heslop-Harrison in 1964, but with no more recent record given there. 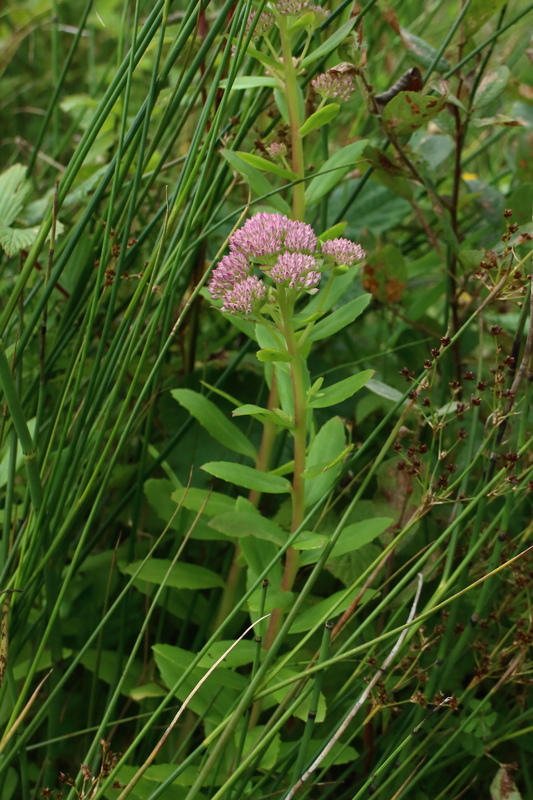 The Hybrid Flora reports the hybrid in a total of 28 hectads in the British Isles, with most in south-central England and the Outer Hebrides. Much recording going on around the county! 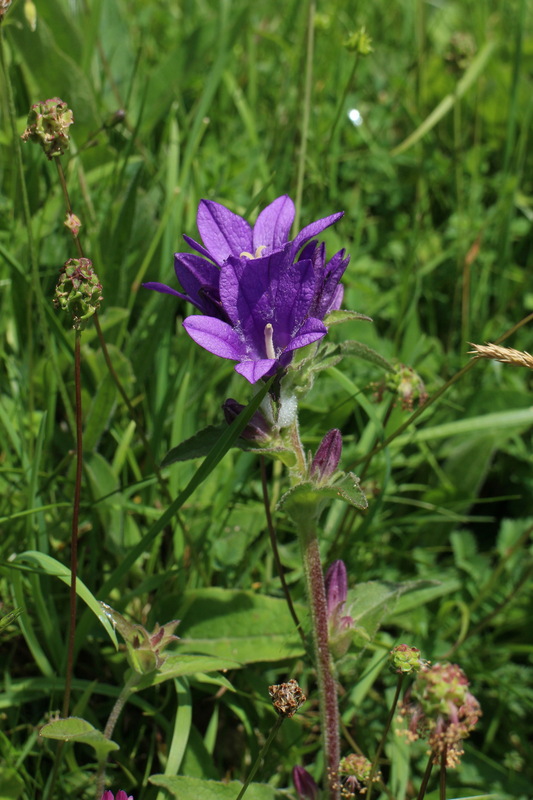 One of my favourite plants, Campanula glomerata, Clustered Bellflower, is showing well at a few sites in the county. 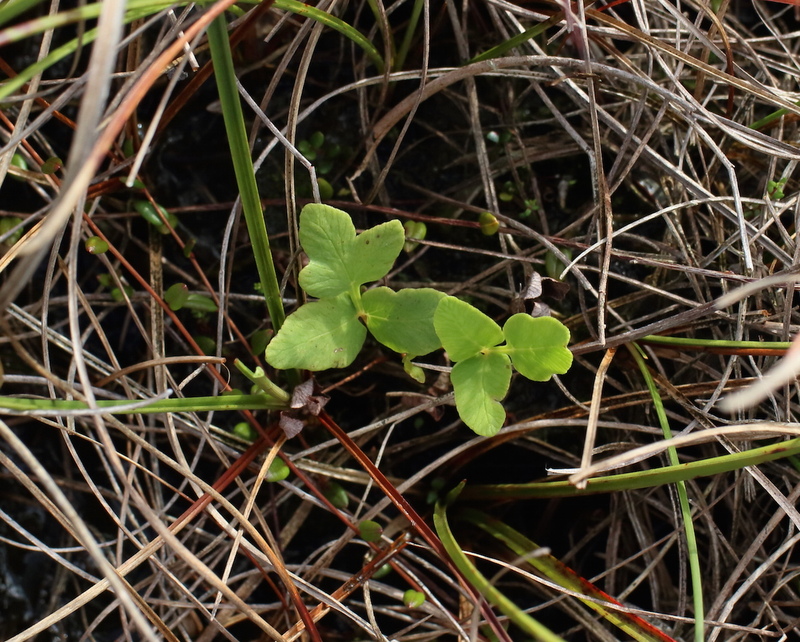 In the open and sunny sites on thin limestone soils east of Shap, even at 340 metres altitude, a few shoots are already in flower, but more are still in early bud. 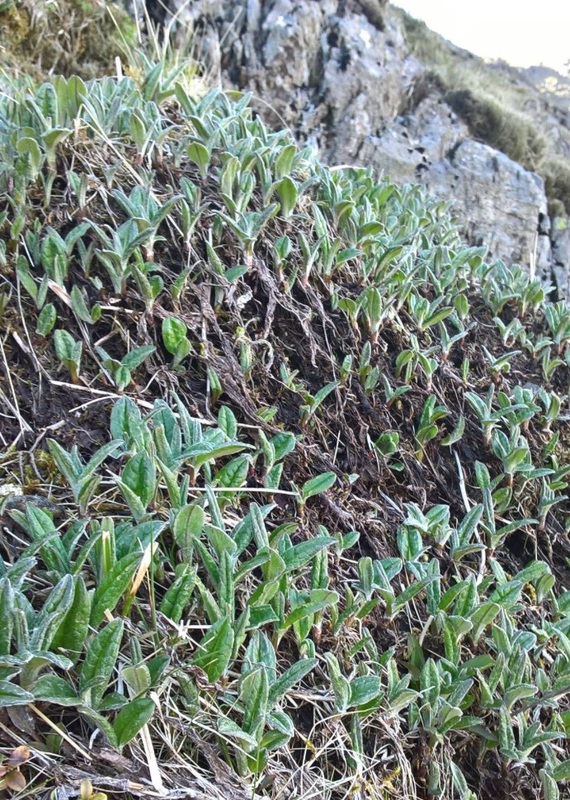 Typical heights of shoots are about 30 centimetres. Before a Carlisle Natural History Society outing at Clints Quarry CWT Reserve, we called in at Maryport Marina. 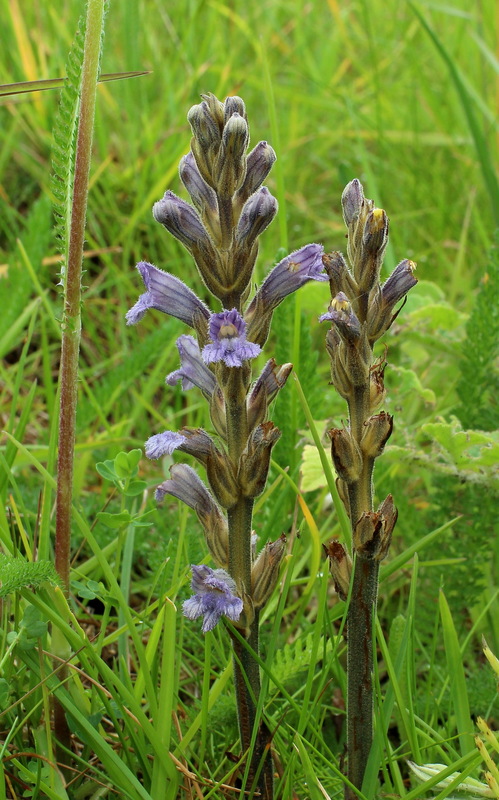 The Yarrow Broomrape ~ Orobanche pupurea was in astonishing abundance over a large area: has anyone had time to do a thorough count in recent years? 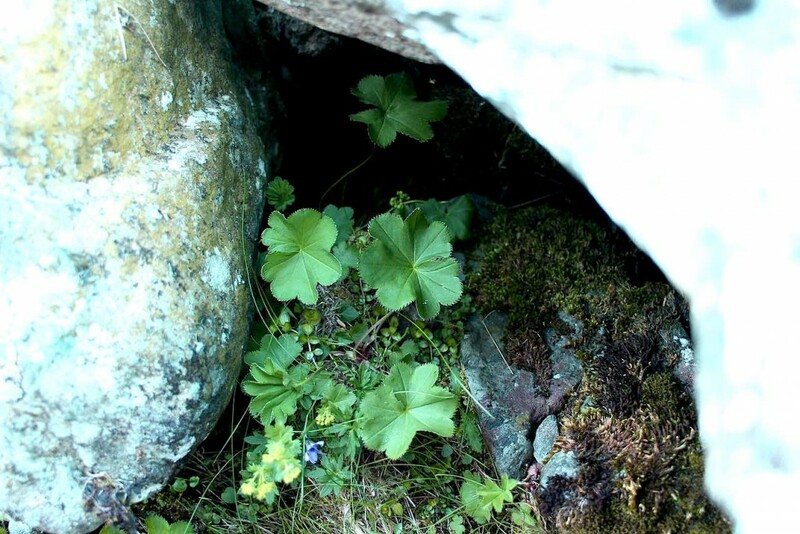 It was first found here in 1983 (A Flora of Cumbria). Its existence here is a puzzle, with the nearest sites being in Lincolnshire and South Wales. However it arrived, it is clearly very well-suited to the situation (artificial slag and ballast heaps) and the local climate. 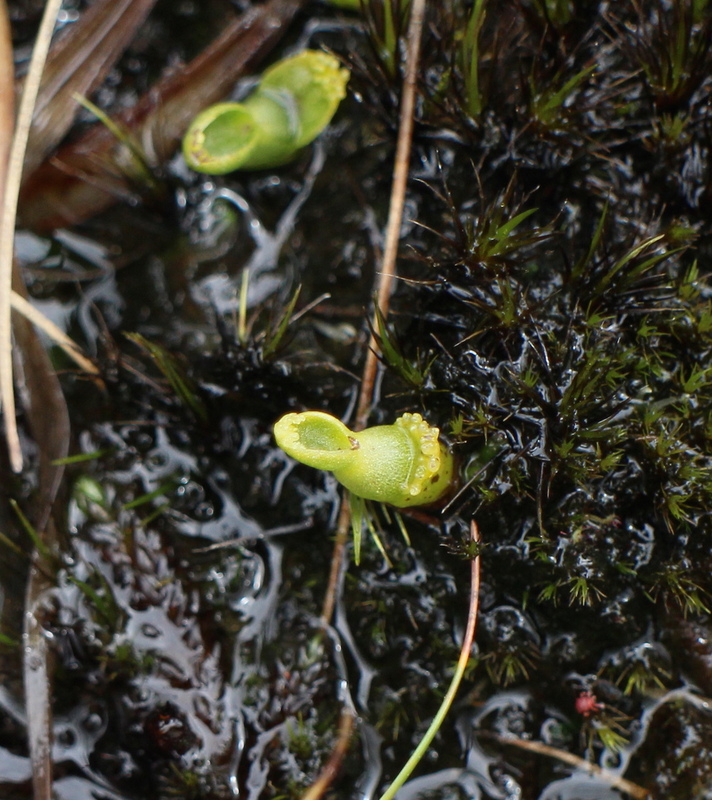 One of the specialities of Borrans Marsh, at the head of Windermere: Carex aquatilis, Water Sedge. 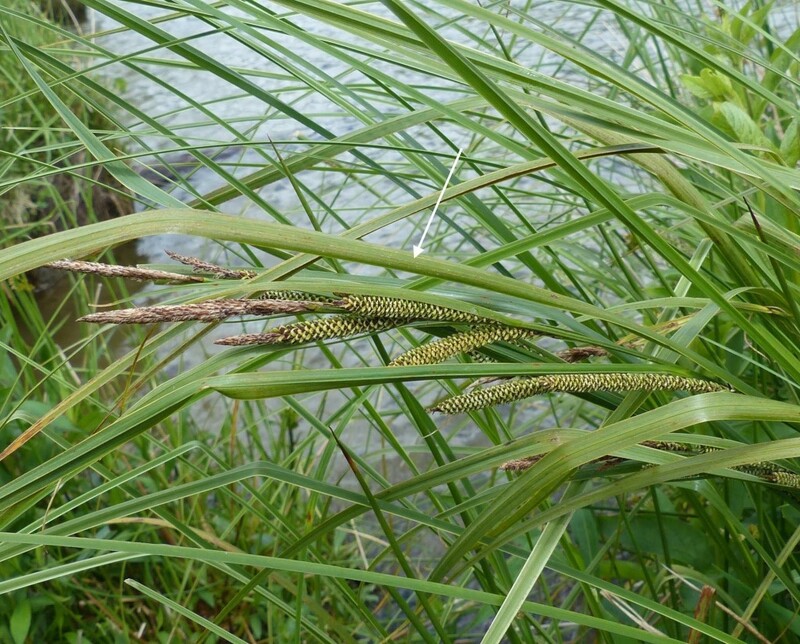 Small forms, not quite so well defined as the one pictured, grow in patches across the marsh itself, but perhaps the best forms occur in small quantity in the strip of marginal vegetation by the river to the west, growing with Typha angustifolia, Lesser Bulrush (*), and other tall emergents. 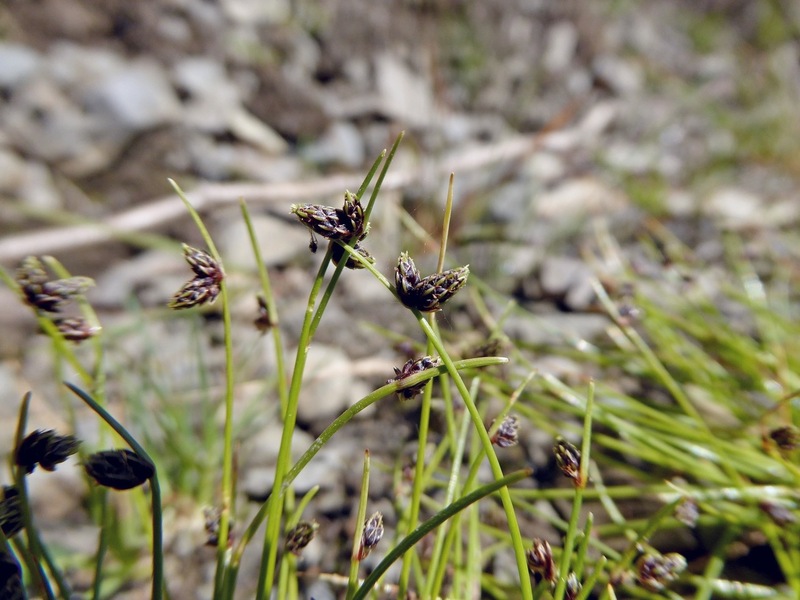 A member of the Carex nigra (Common Sedge) group, it has just two stigmas (thus distinct from a great many other sedges, which have three, although only useful before the stigmas shrivel, and eventually are shed). 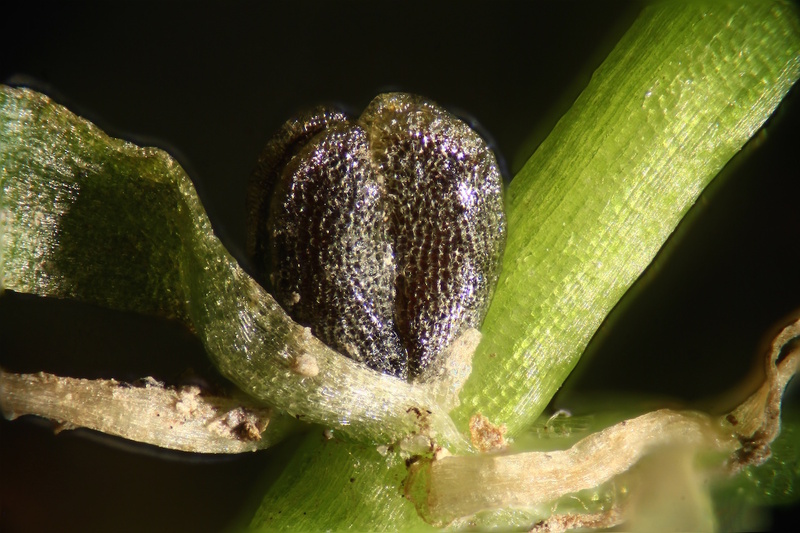 It is closest to Carex nigra itself, in being patch-forming rather than strongly tufted, and in having the stomata on the upper or inner surfaces of the leaf, making that surface matt and grey, whilst the lower or outer surface has few stomata and so is shiny and green. 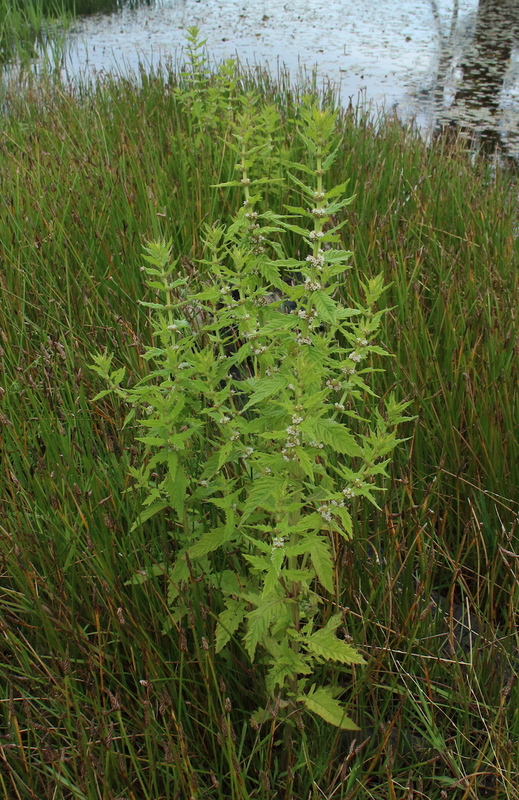 The finest UK sites are probably those in the Spey Marshes, where the plant may be dominant, and over 1.5 metres tall. 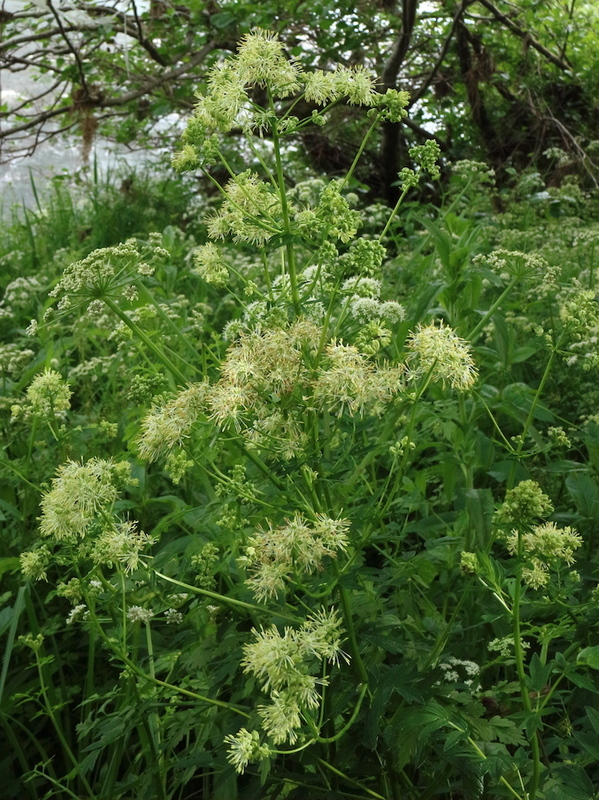 In a strong wind, the long bracts sweep, sway and hiss! The other patch-forming sedge in this group, Carex acuta, Slender Tufted-seddge, also has longer bracts, although not so splendidly developed as here, but that has stomata on the lower surface only, and a sharply-angled stem. 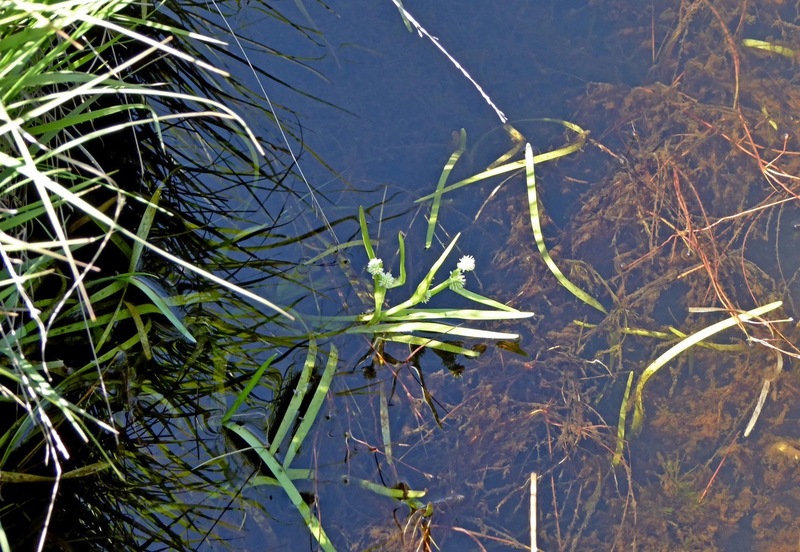 Water Sedge occurs in several of the swamps and marshes in the Lake District, by the River Irthing in far north-east Cumbria (and on a few other riversides), and there is a recently-found series of patches of a stunted form by the Pennine Way on the north side of Great Dun Fell at 800 metres a.s.l., in which the stem is actually much shorter than the inflorescence. 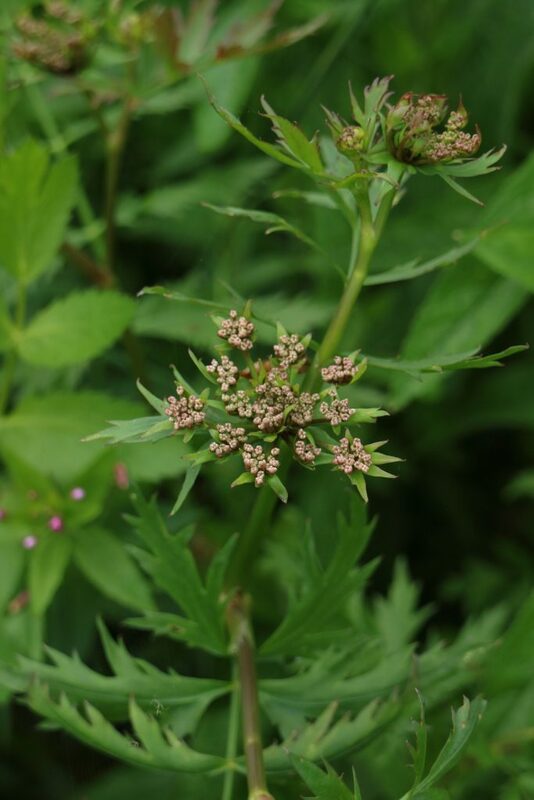 This form grows taller when cultivated at low altitudes, so may be stunted simply by the climate at height (Linda Robinson, pers. comm.). 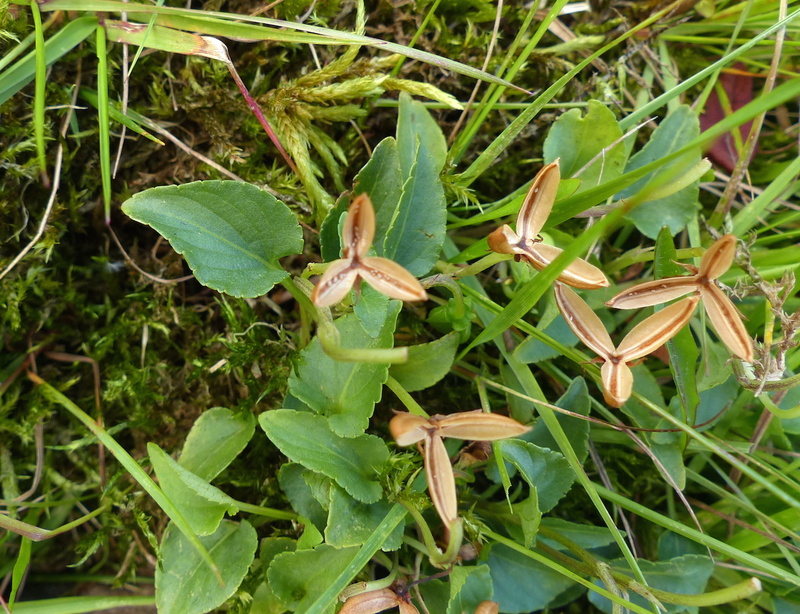 A Flora of Cumbria Recording Group meeting to the Aspatria area in West Cumbria. 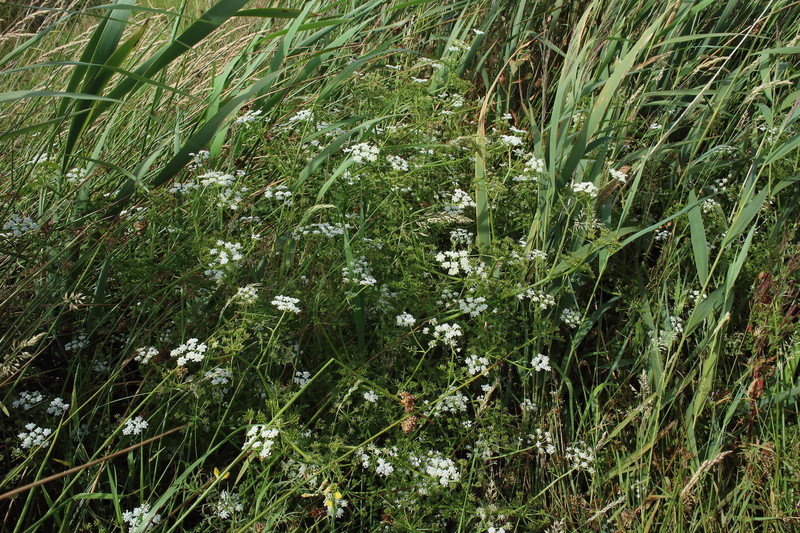 On this sandy ground (with a huge sand-quarry across the road), in an uncropped corner of a field at Aikshaw, north of Aspatria, there was a cluster of delightful arable weeds. 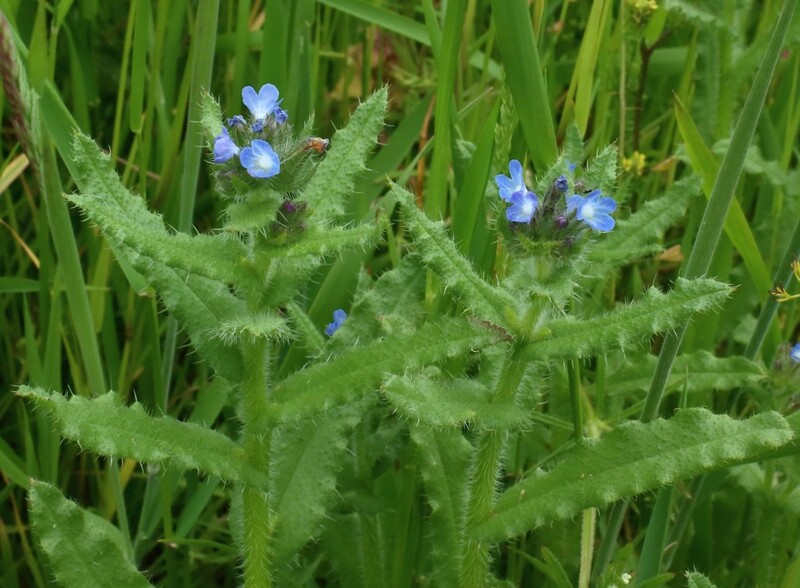 Most conspicuous were masses of Bugloss ~ Achusa (Lycopsis) arvensis. 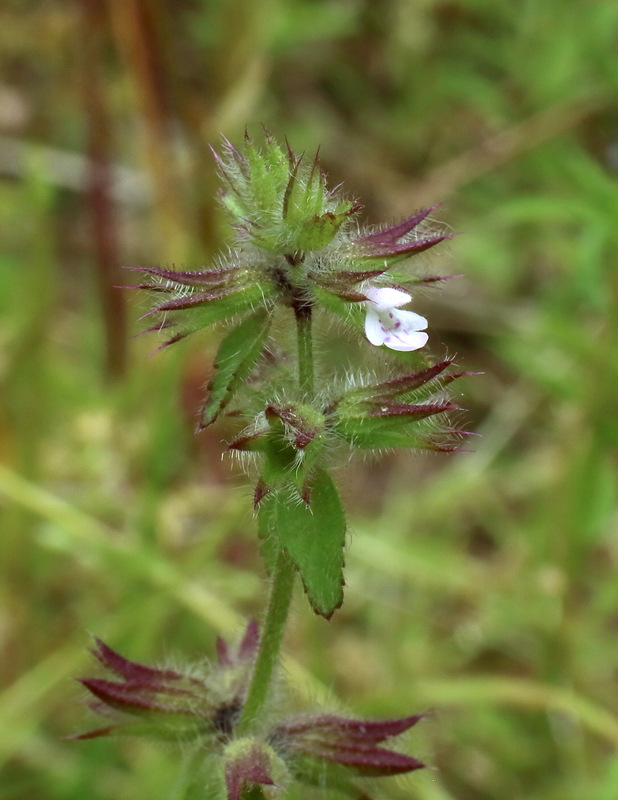 There were many plants of Corn Spurrey ~ Spergula arvensis and Field Pansy ~Viola arvensis, and a couple of plants of the local Field Woundwort ~ Stachys arvensis: all those “… arvensises” (“of the fields”). A meeting of the Flora of Cumbria Recording Group to the Warcop area, in the upper Eden valley, on a warm and sunny day. 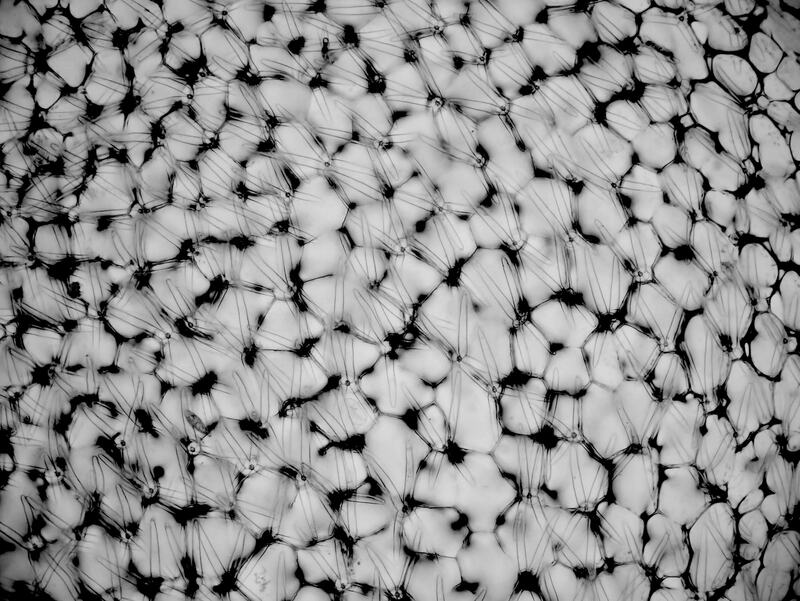 Lists were collected in three tetrads. 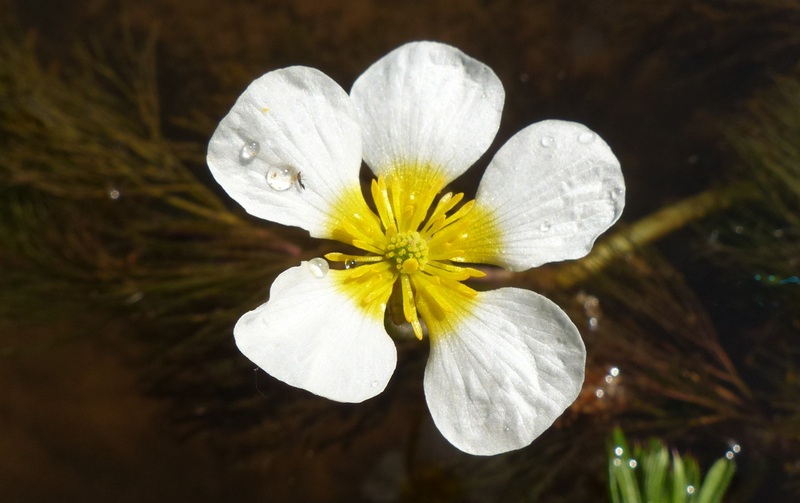 Few highlights, but the very local water-crowfoot Ranunculus pencillatus subspecies pseudofluitans was admired at Warcop Bridge. 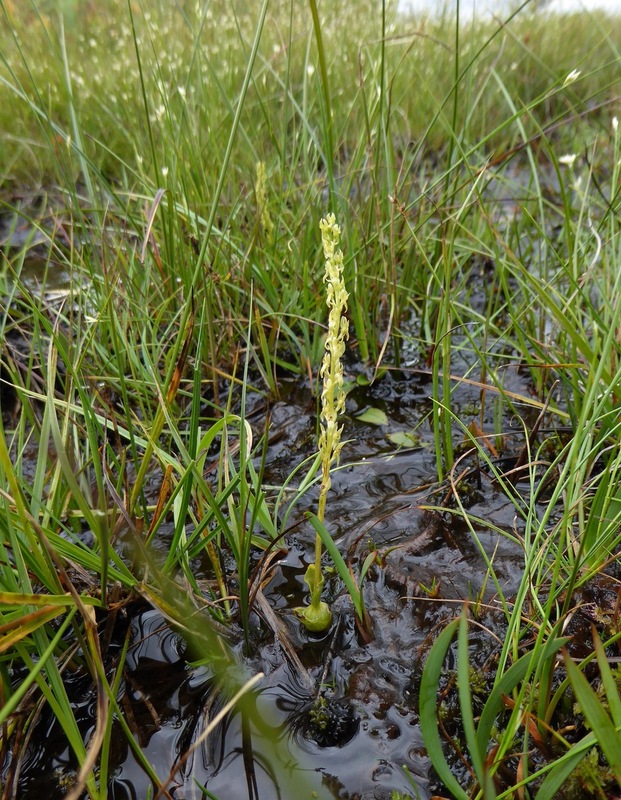 Mike Porter brought the participants of his ever-popular ‘Sedge Day’ to Dubwath Silver Meadows (as below) on the afternoon of 6th June, particularly to see the Water Sedge – although the wind was so fierce and cold that the various wattle-and-daub huts on the site were welcome retreats! A Carlisle Natural History Society outing to Dubwath Silver Meadows (by the Pheasant Inn, at the north end of Bassenthwaite). 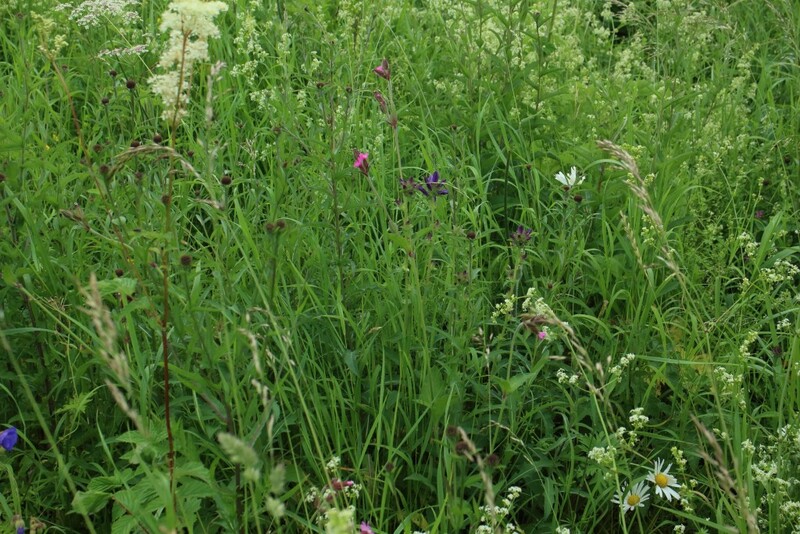 The site is being managed to enhance its wildlife value and to protect the catchment’s water supply. New boardwalks and paths allow access to the various features of swamp, willow carr, open marsh, and hay-meadow. Please send your comments, suggestions, and any content for “News & Comment”, via the contact form below. © text & photographs. Copyright of photographs remains with the originator. 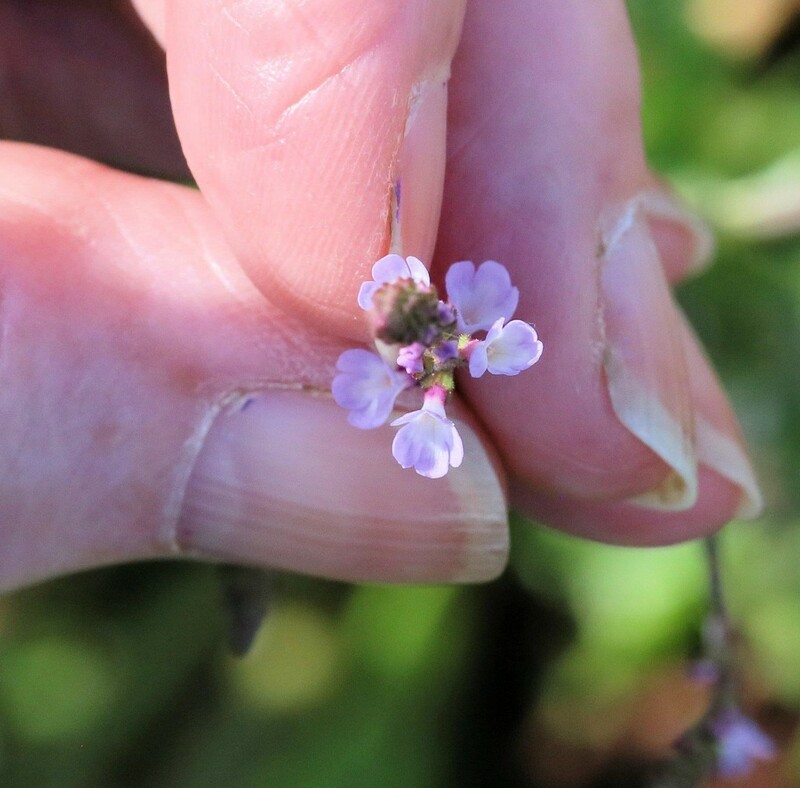 A call for help with running a bioblitz event at Haig pit Whitehaven on Sat 2 July. 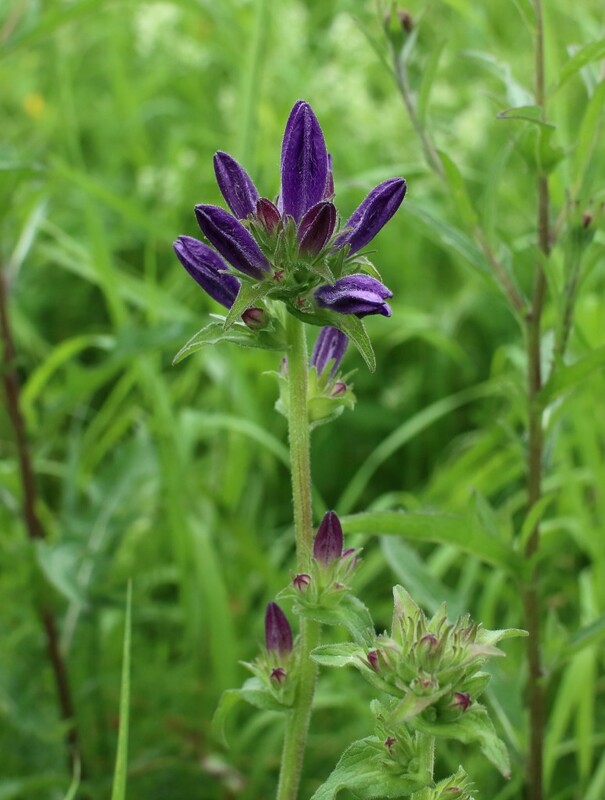 The first one, we have flower rich grassland, coastal heath and scrub habitats and are keen to get as many species recorded as possible to have an idea of how our conservation management is working and if we need to alter our approach to accommodate any of our wild residents. Any help appreciated. 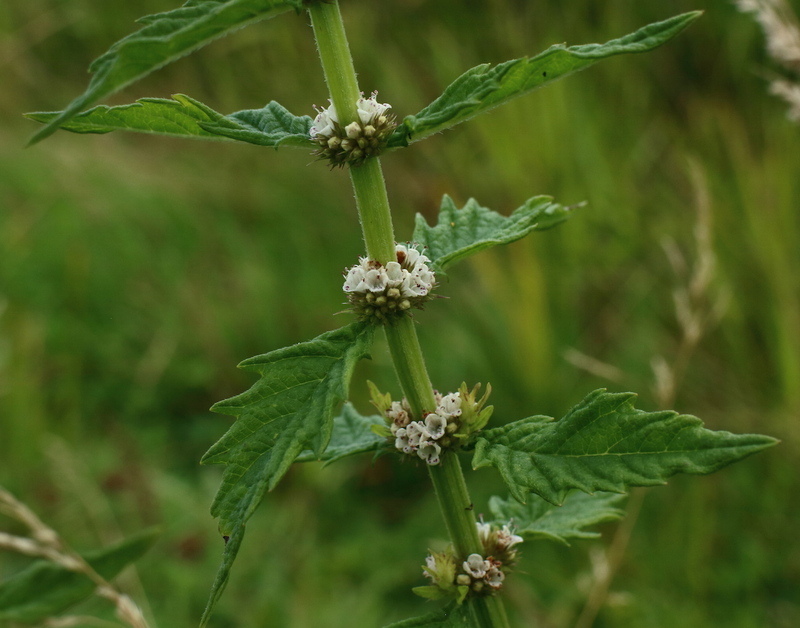 How common is Thorn Apple, Datura stramonium in the county? 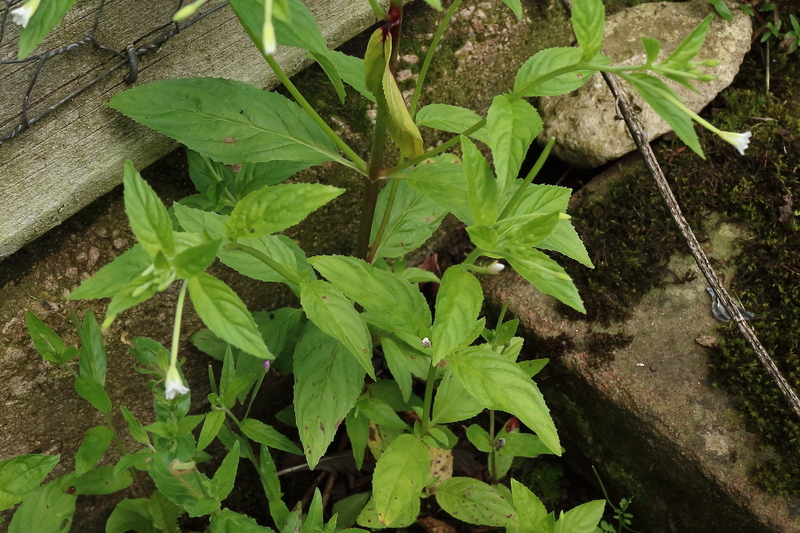 It has popped up in our local allotments (Kirkoswald). 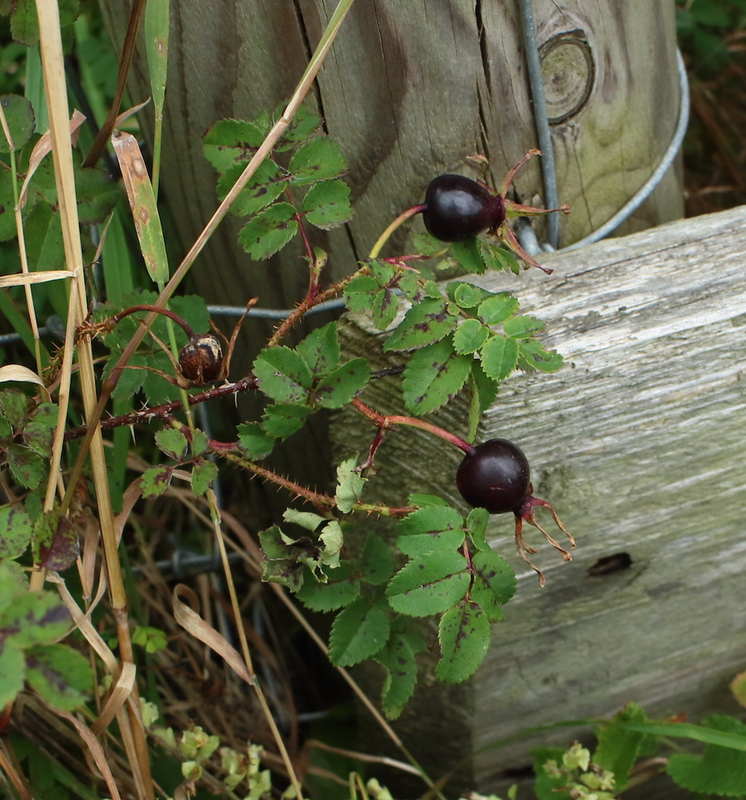 I also have what appears to be an Apple of Peru, Nicandra physalodes. 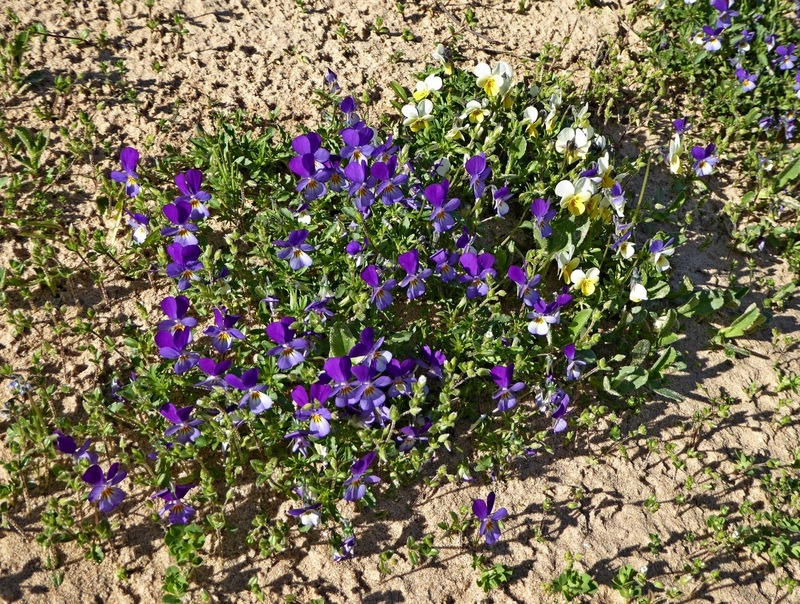 At least, it is a physalis-like plant with blue flowers. Very scattered and irregular, Lois. 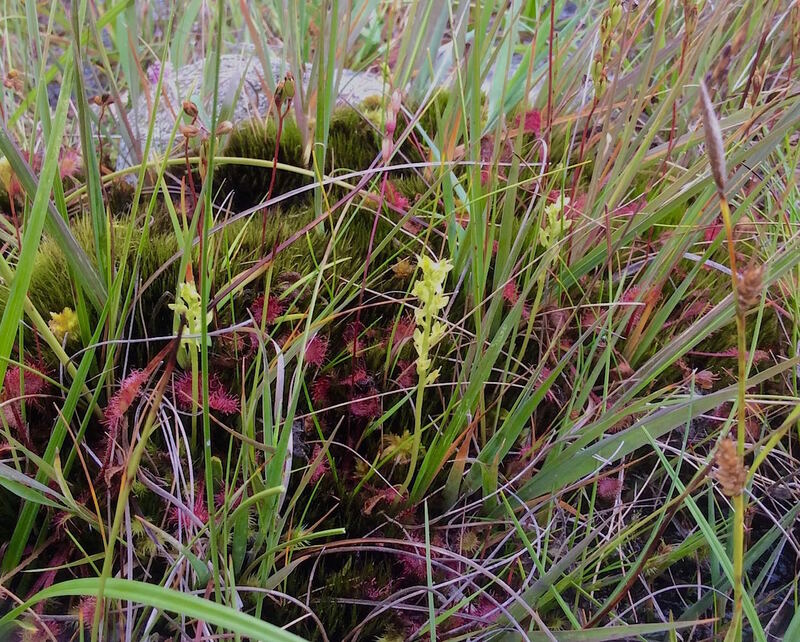 A Flora of Cumbria has eleven records during the Survey period, as you will see. I’m not certain how many records are accruing since that publication. Would be very interesting to know if it is increasing. Do make sure these valuable records get recorded – contact details are elsewhere on this site.